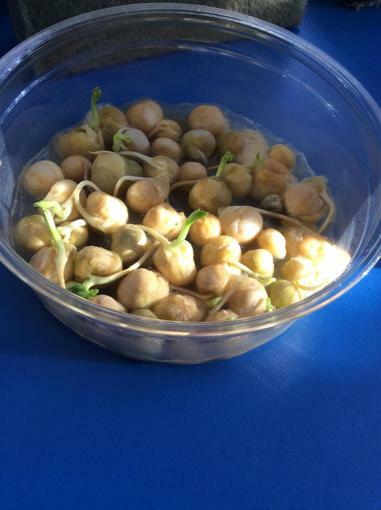 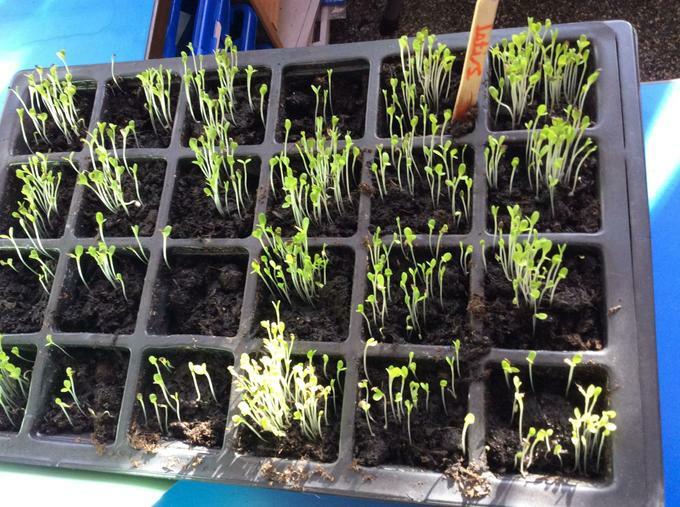 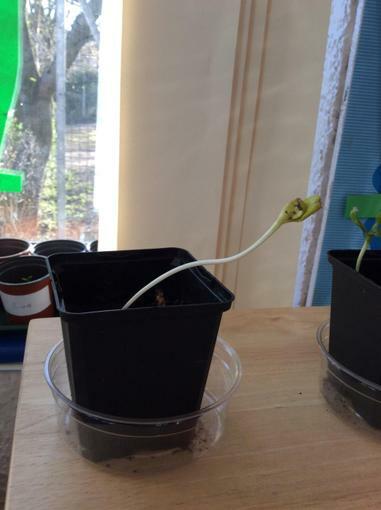 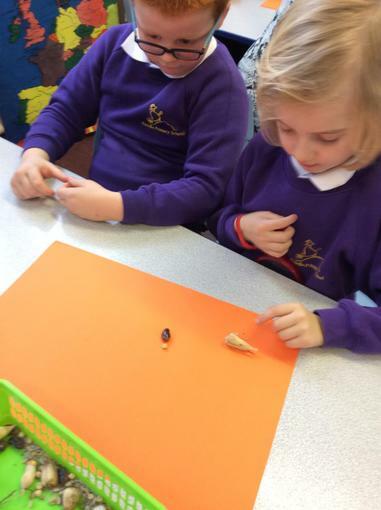 Will a seed grow without light? 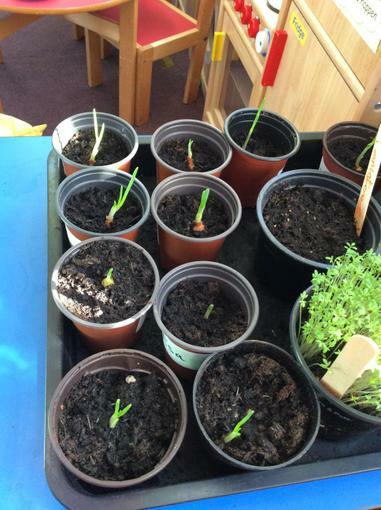 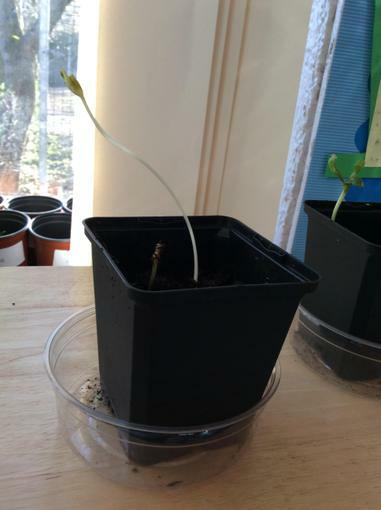 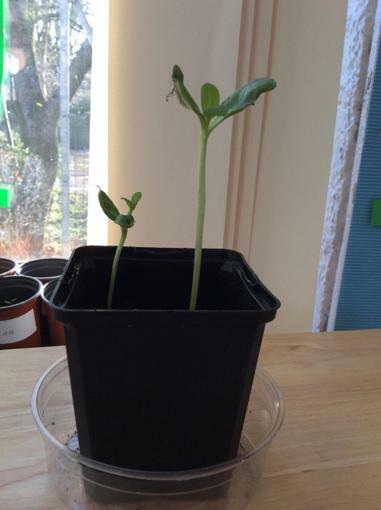 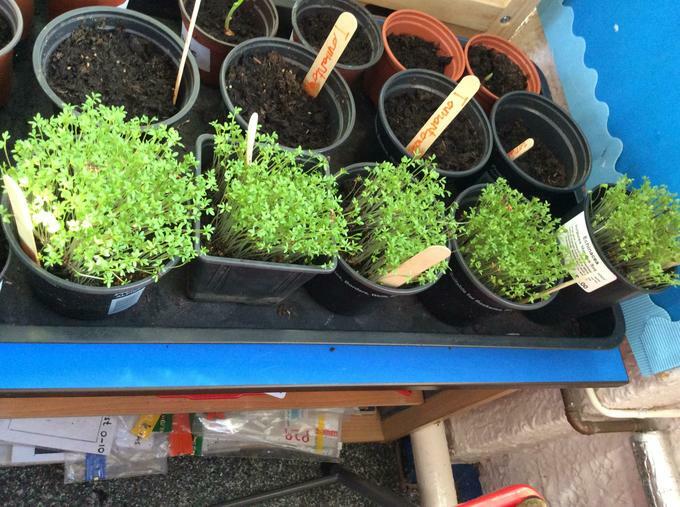 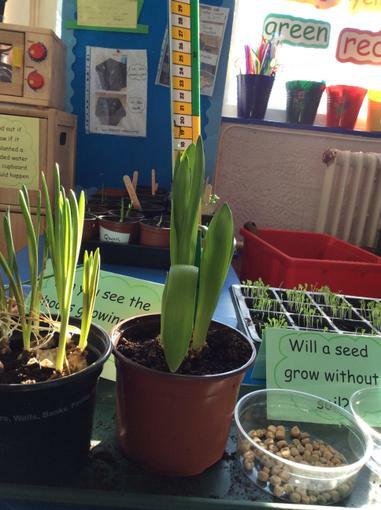 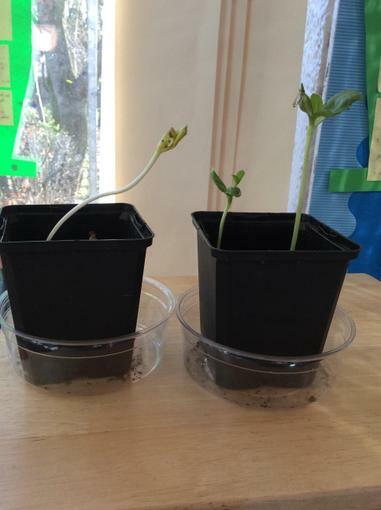 We planted sunflower seeds in two pots of watered soil then put one pot on the windowsill and another in a dark cupboard to find out. 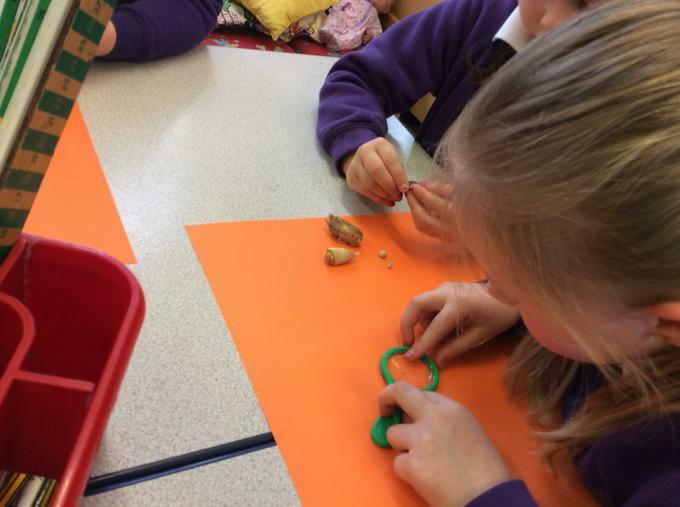 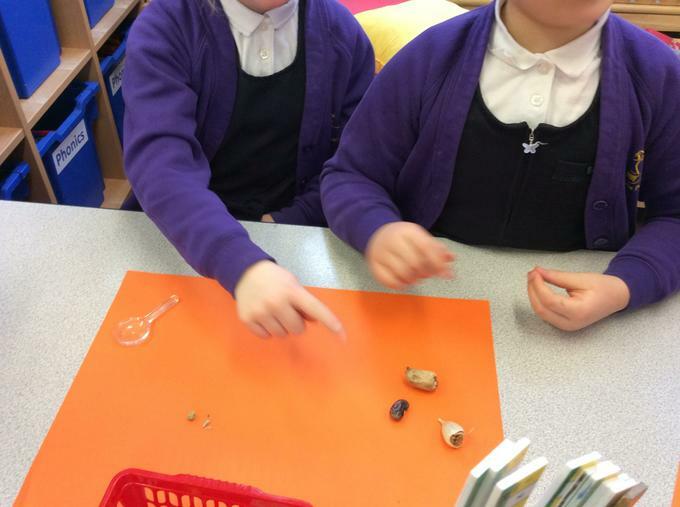 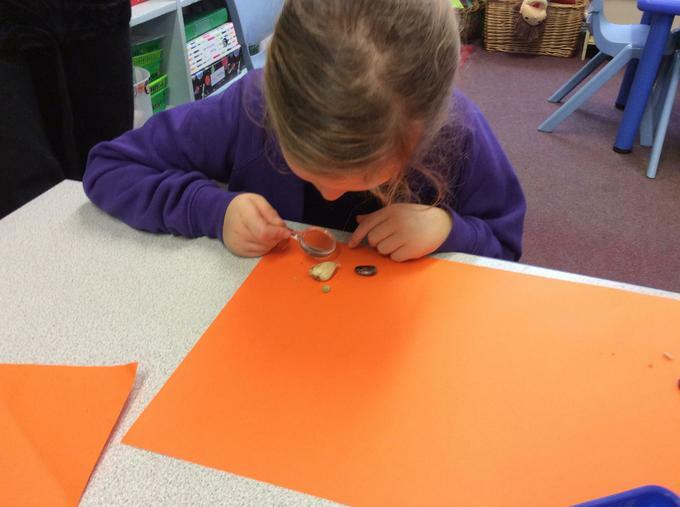 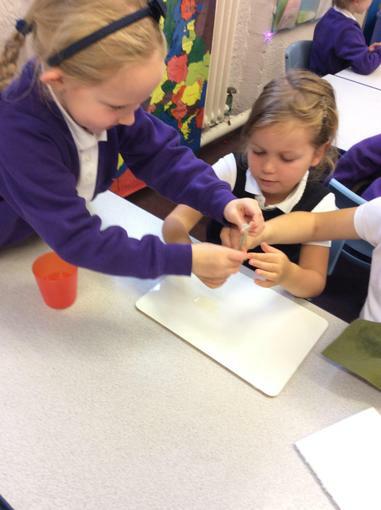 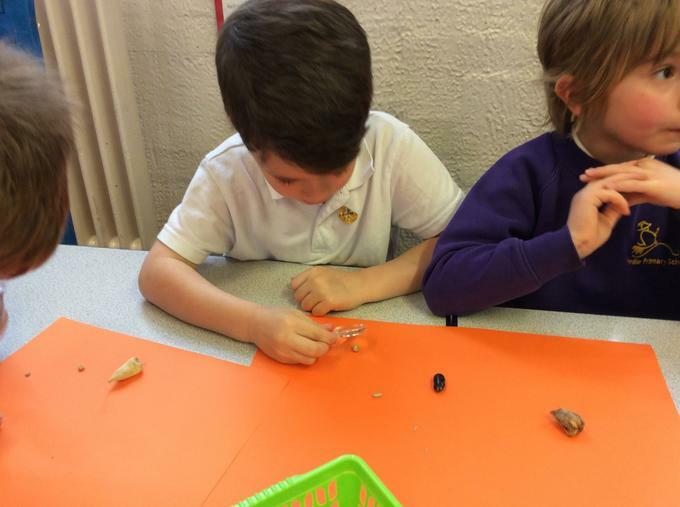 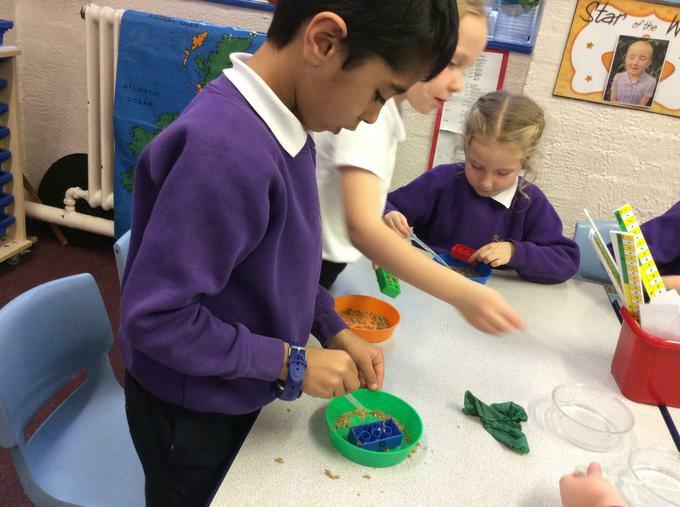 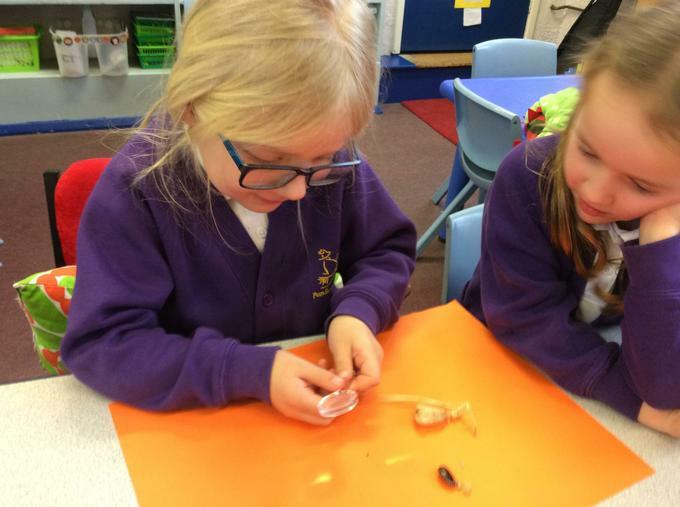 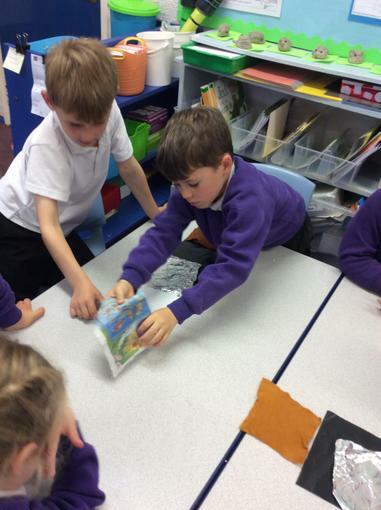 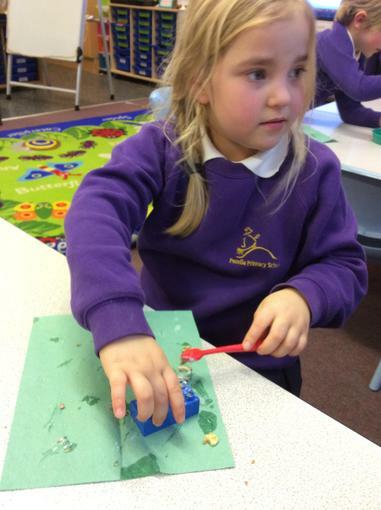 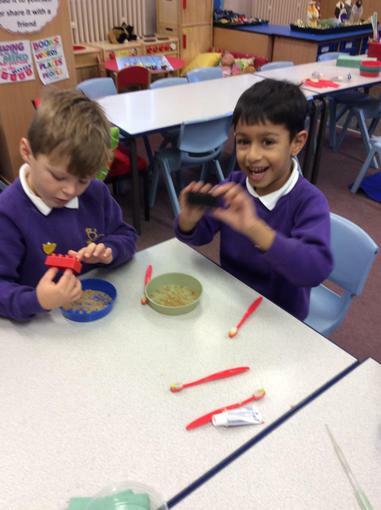 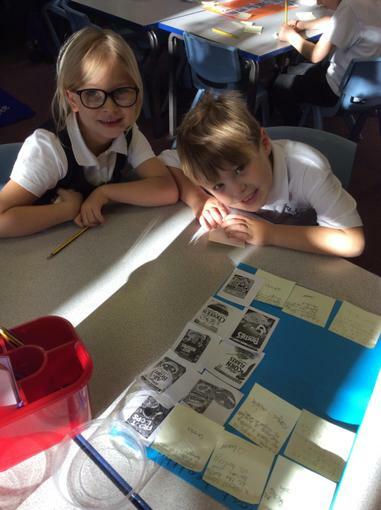 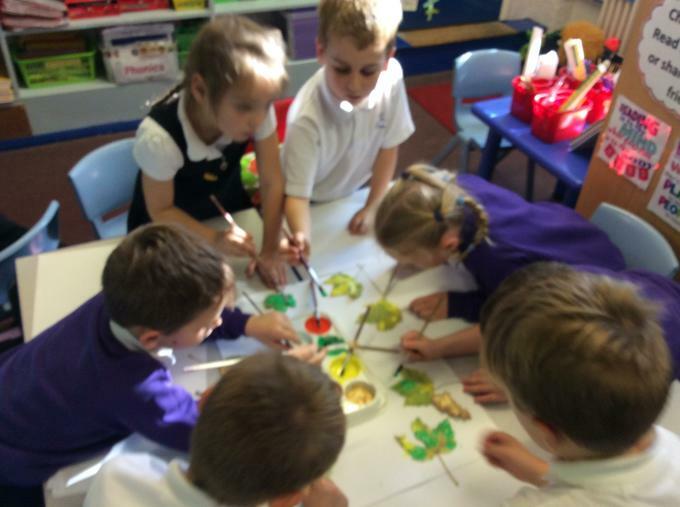 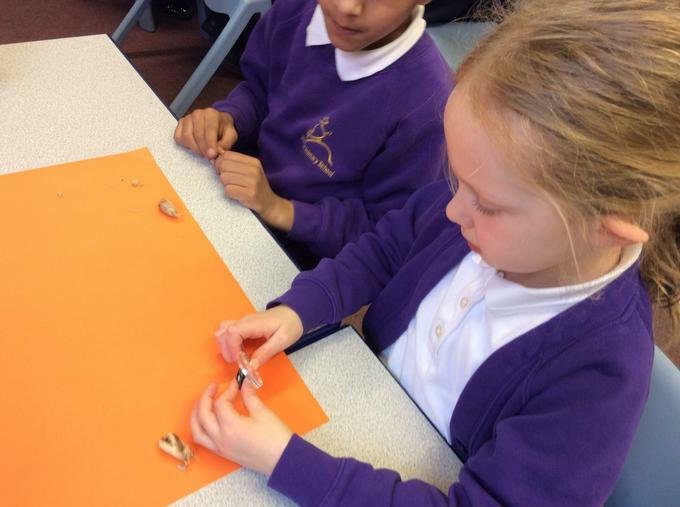 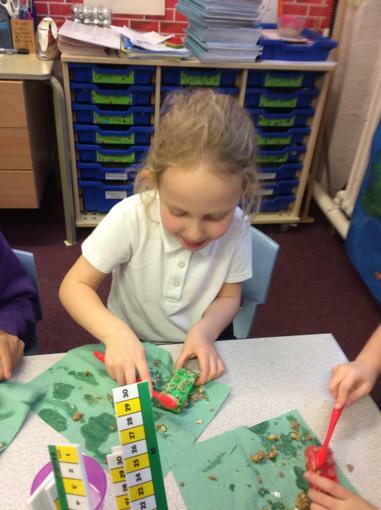 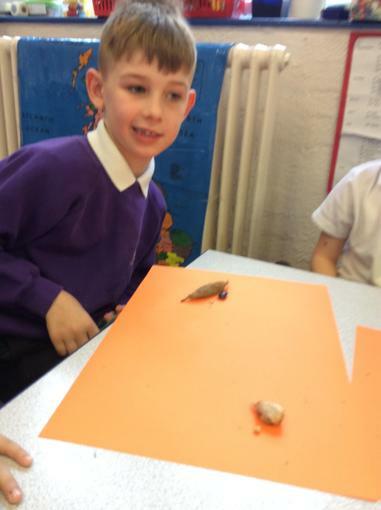 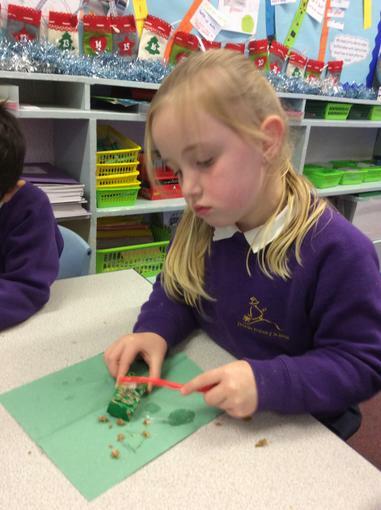 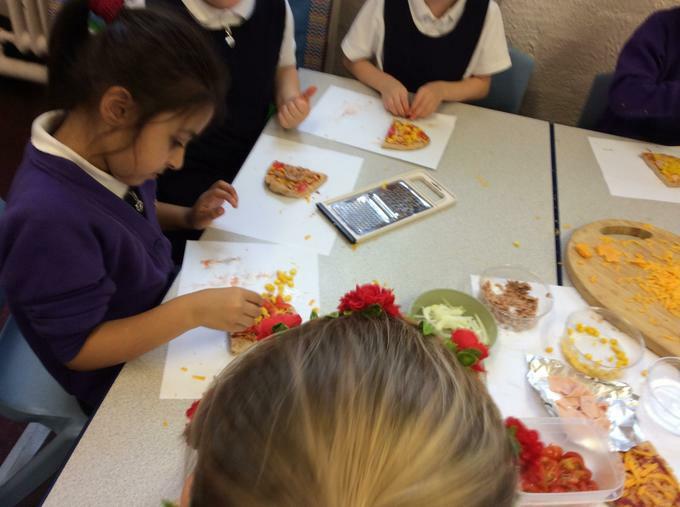 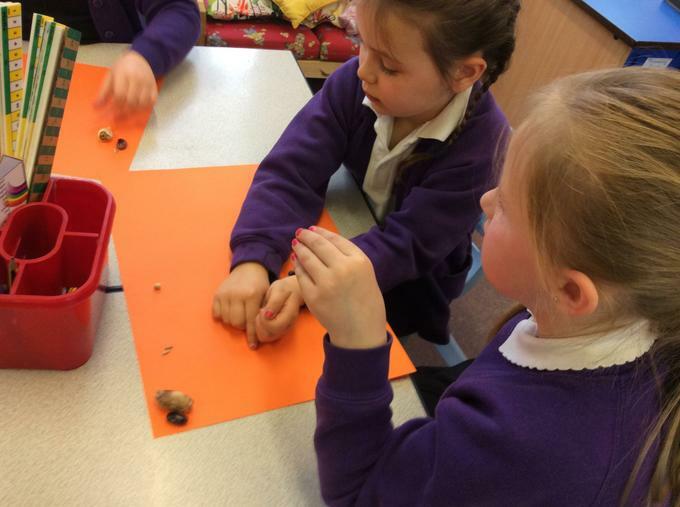 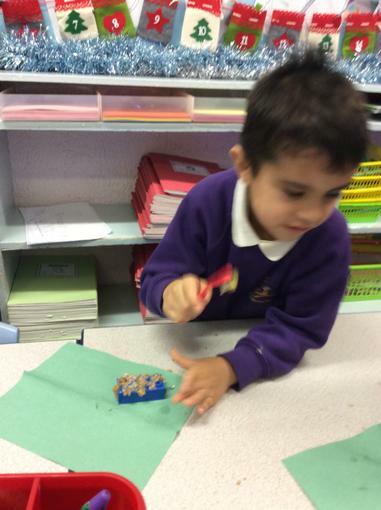 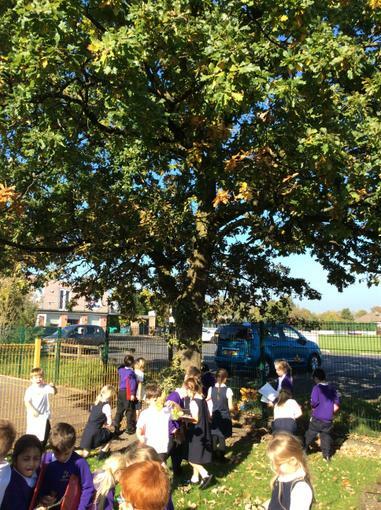 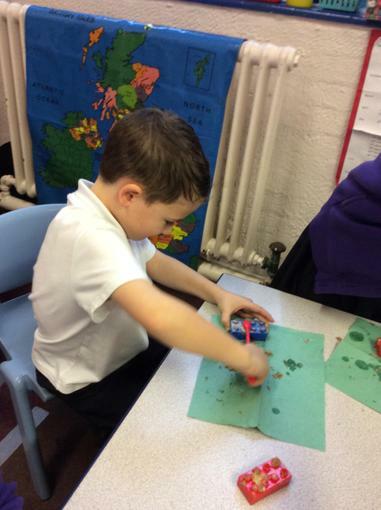 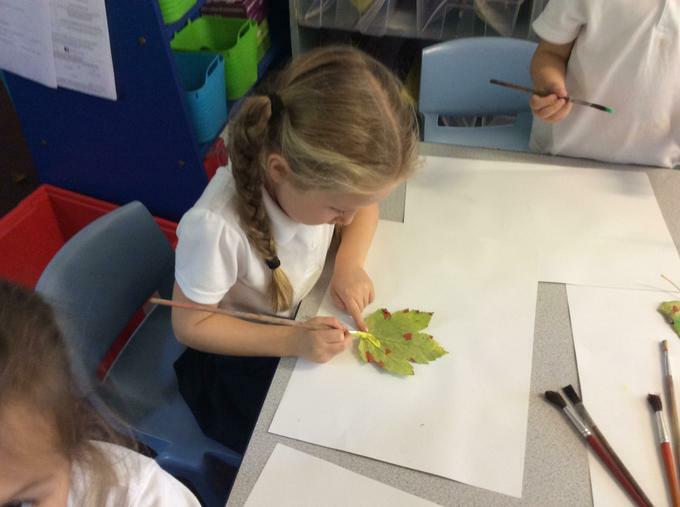 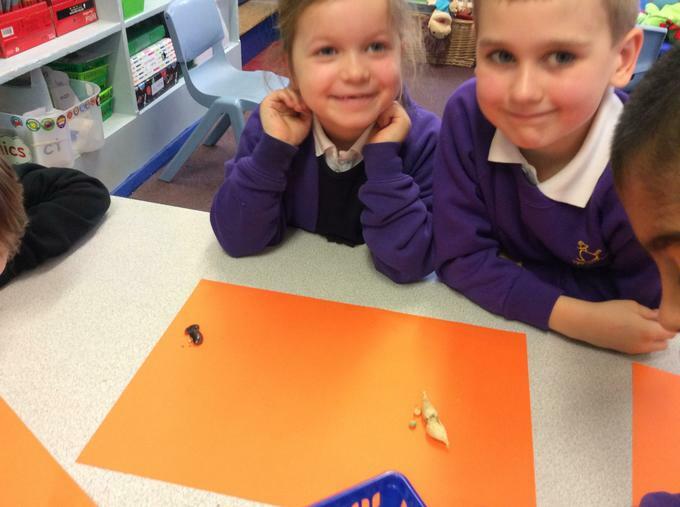 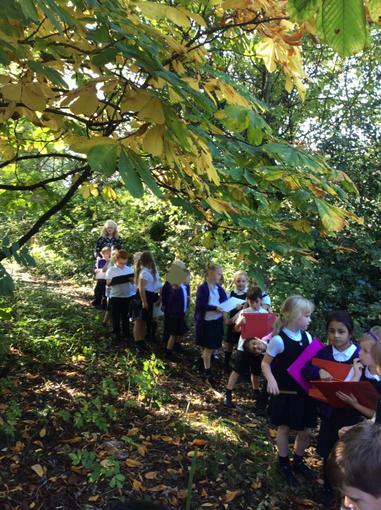 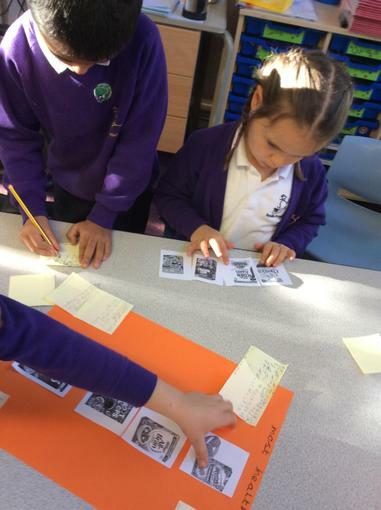 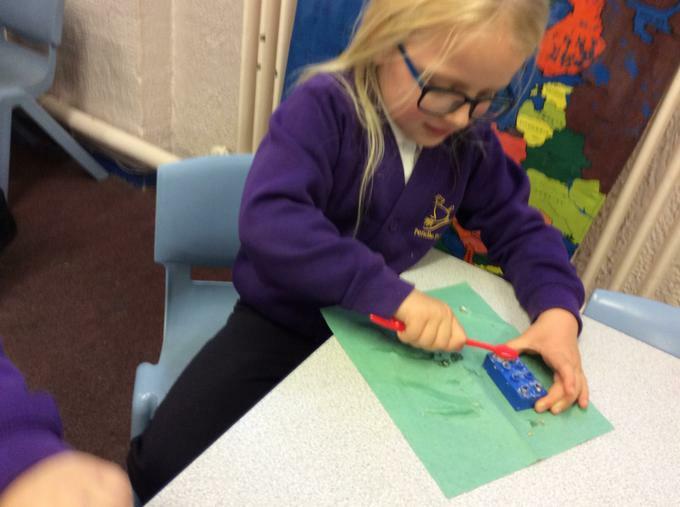 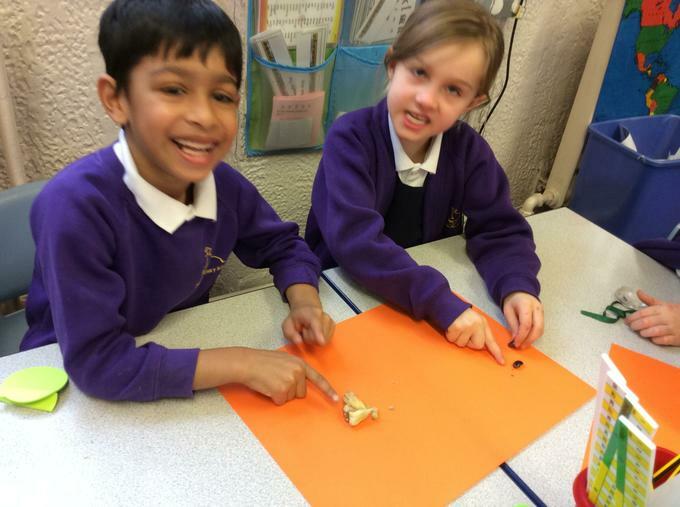 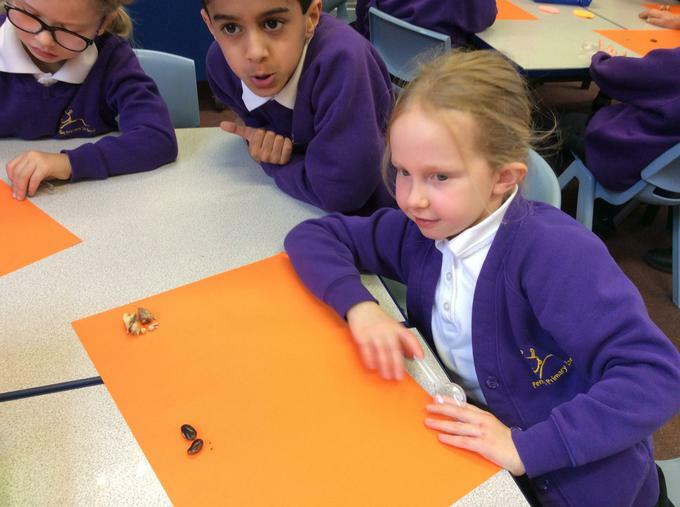 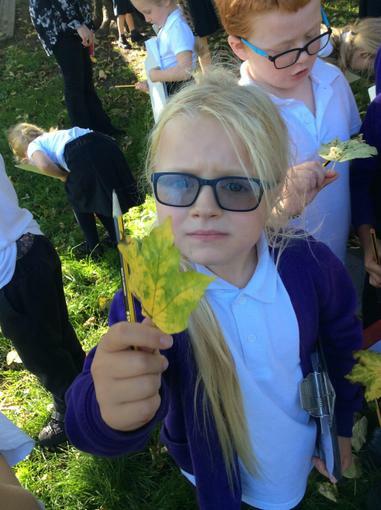 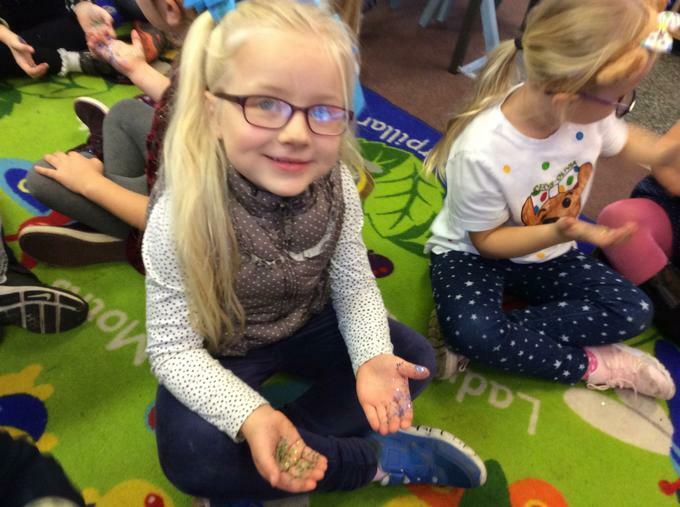 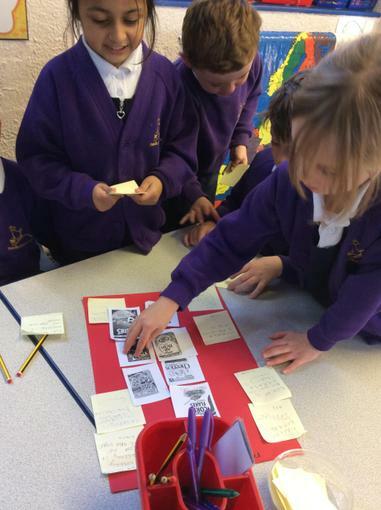 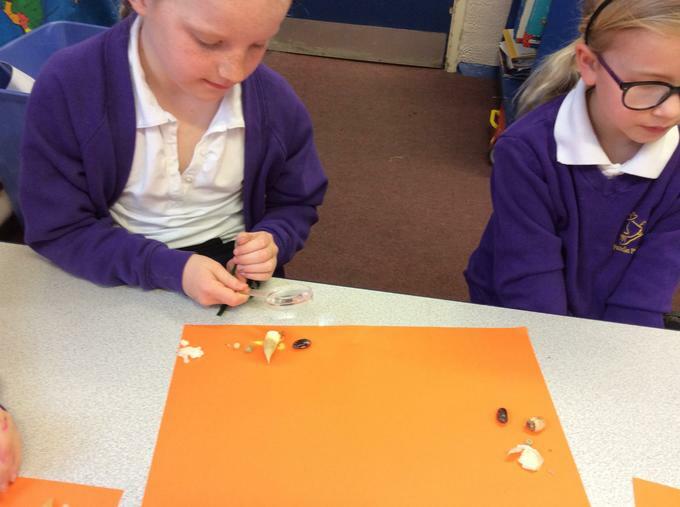 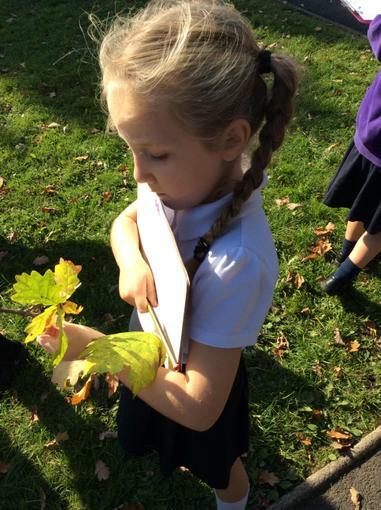 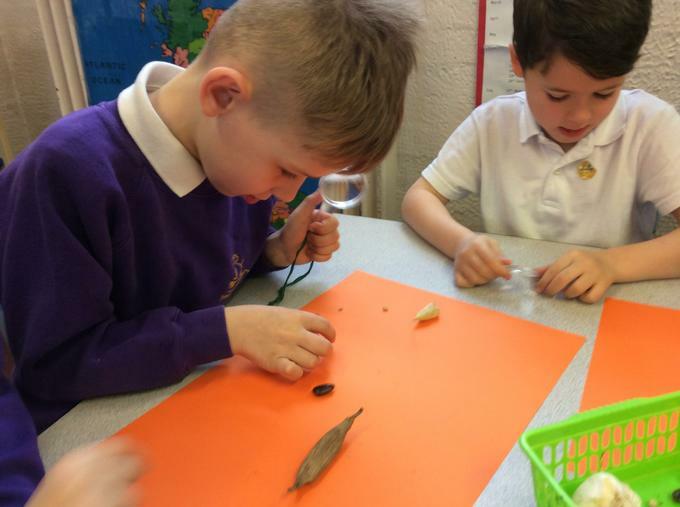 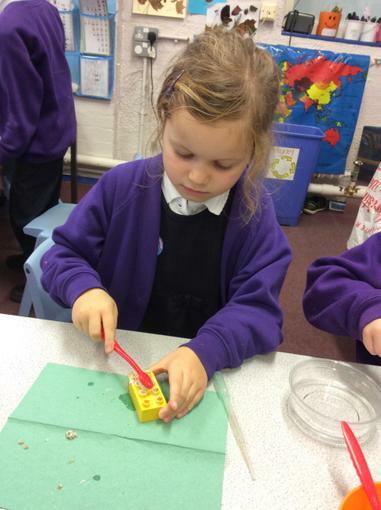 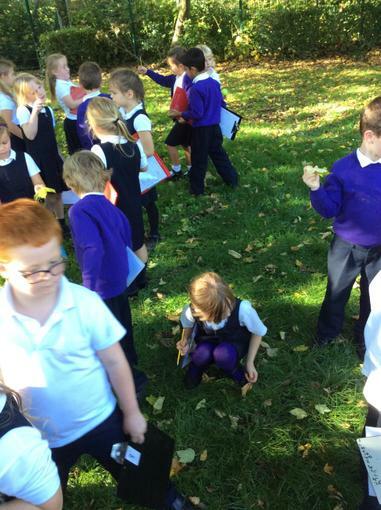 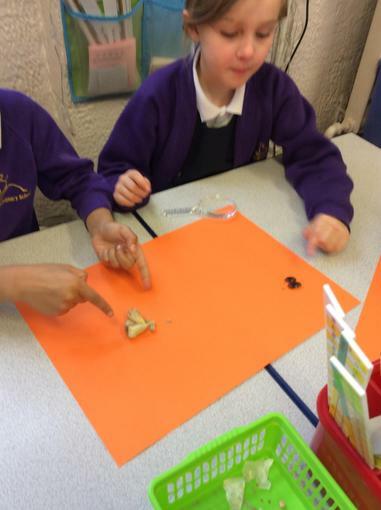 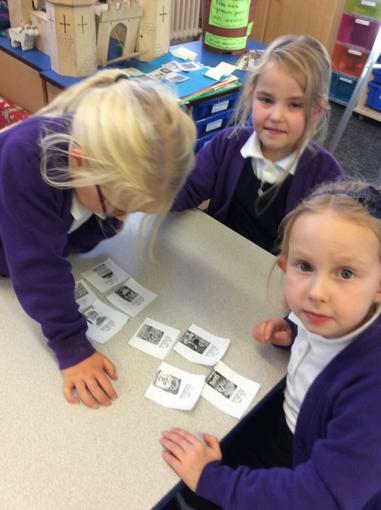 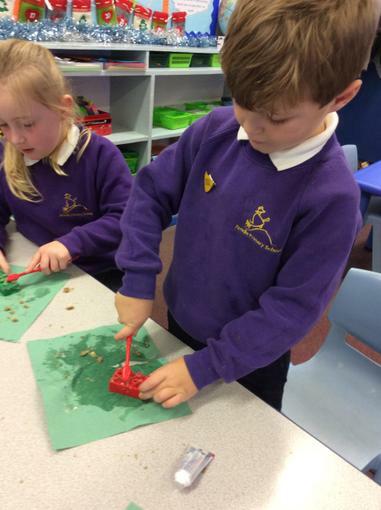 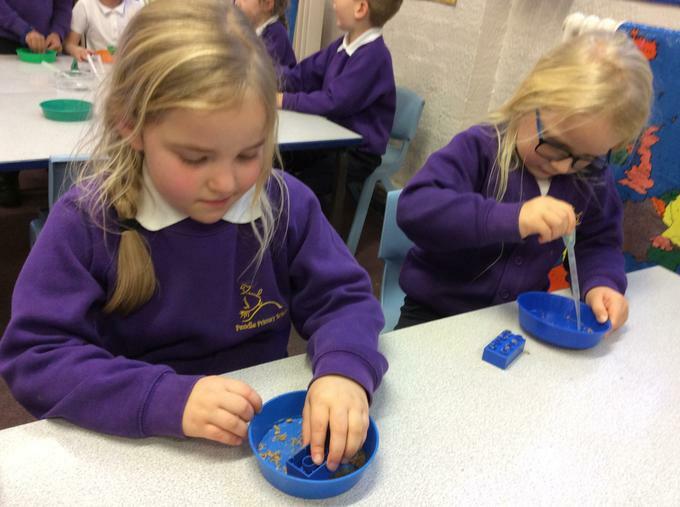 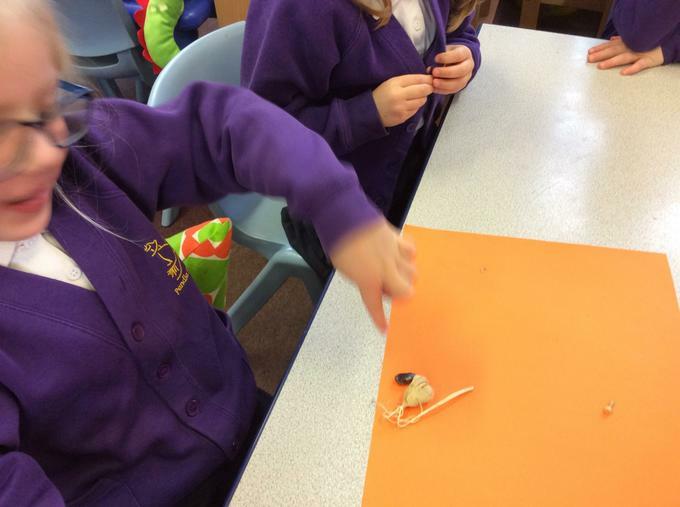 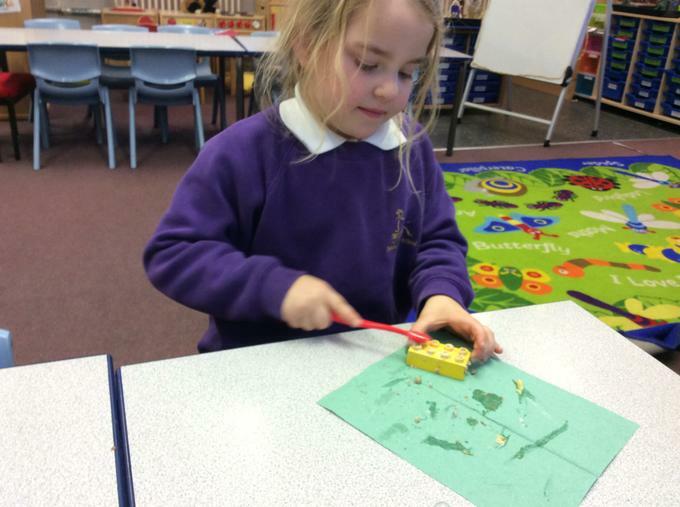 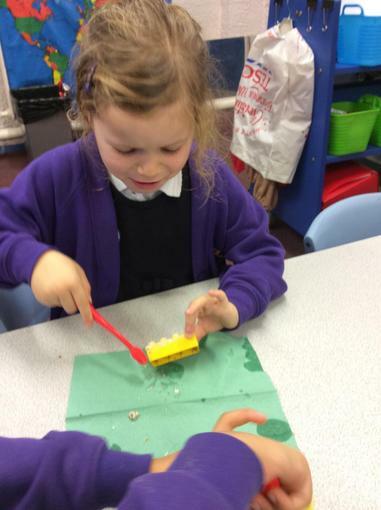 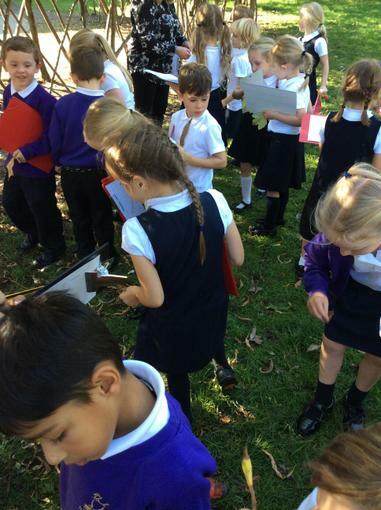 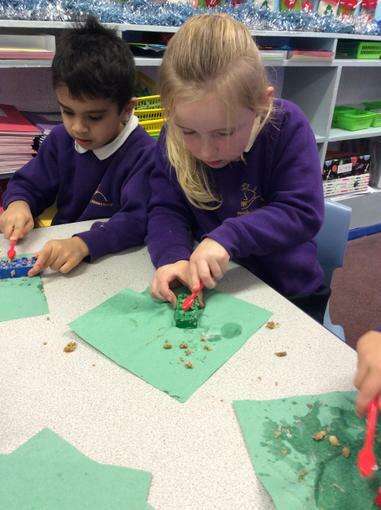 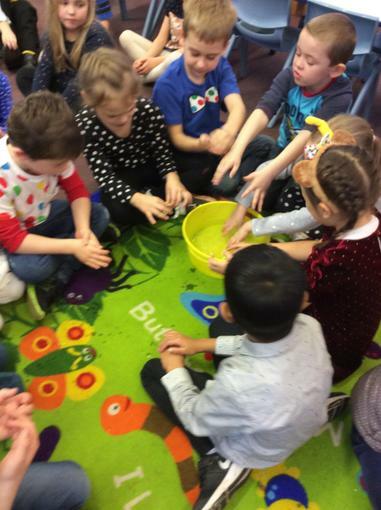 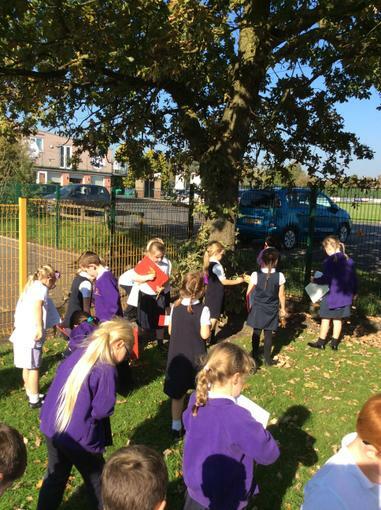 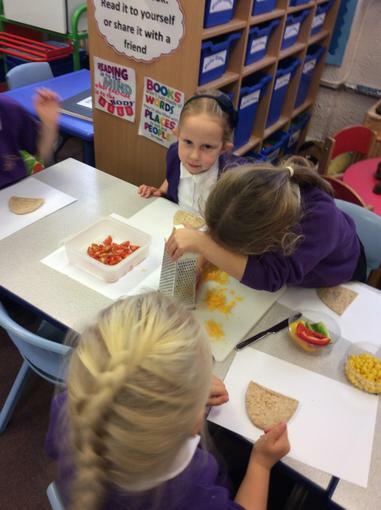 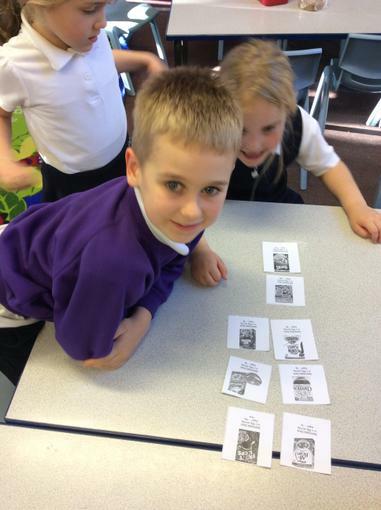 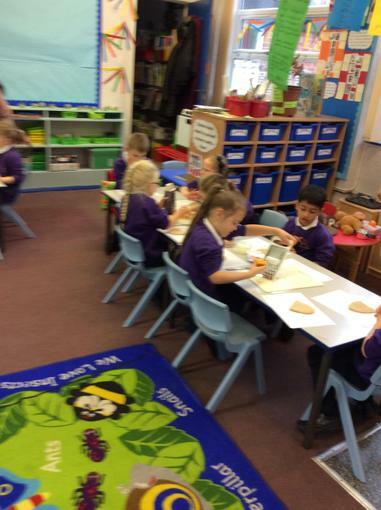 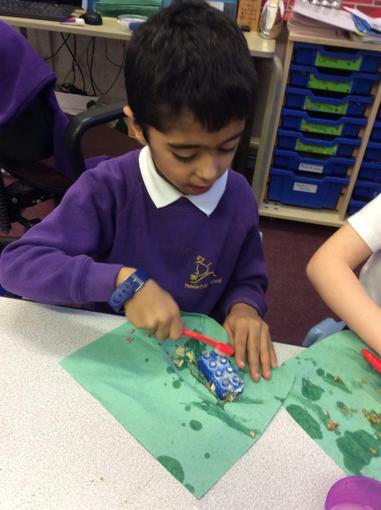 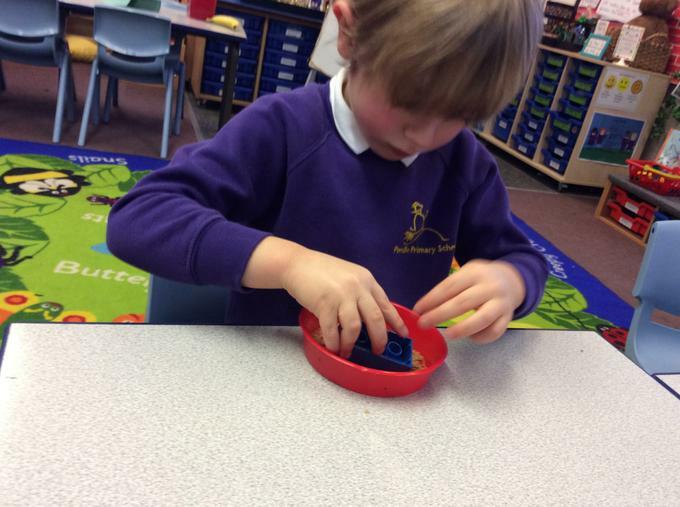 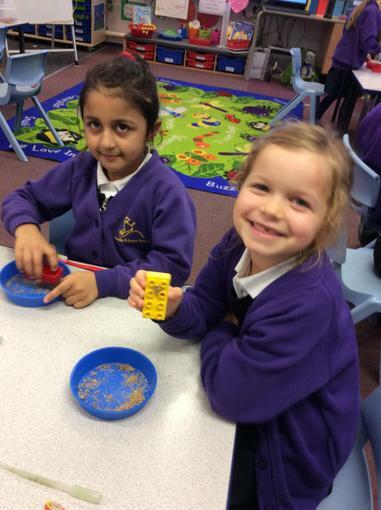 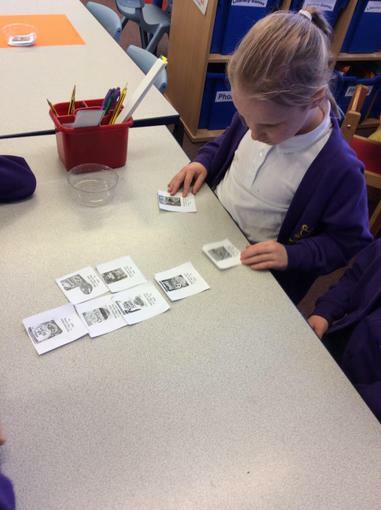 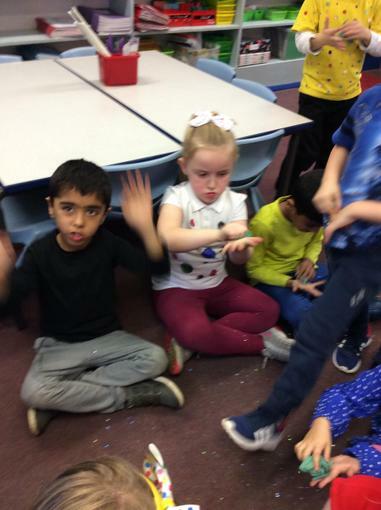 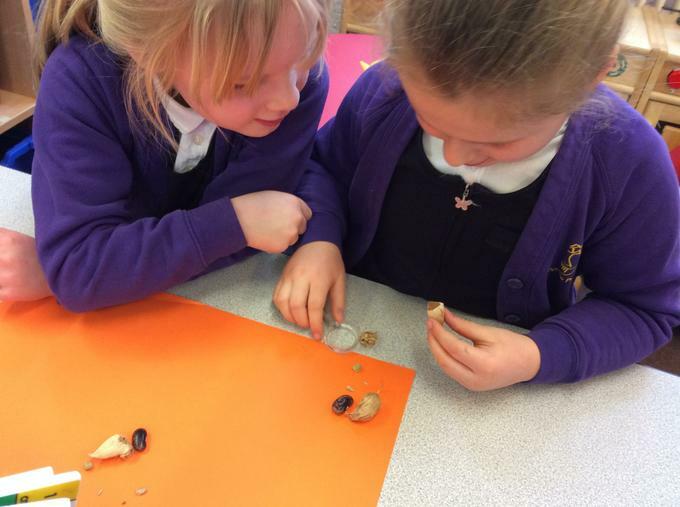 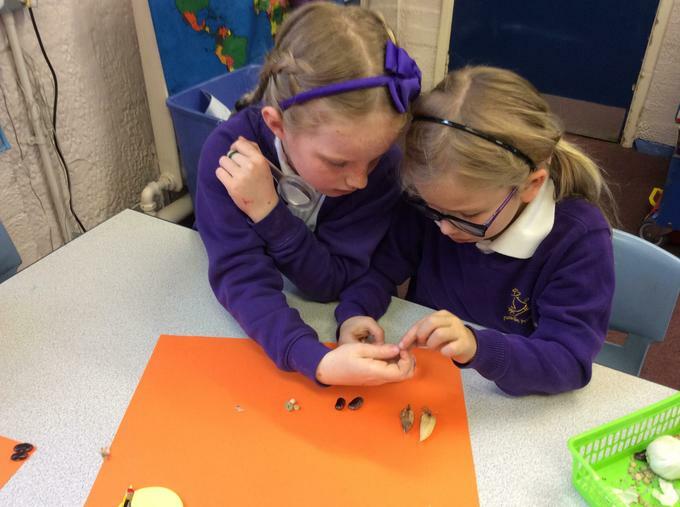 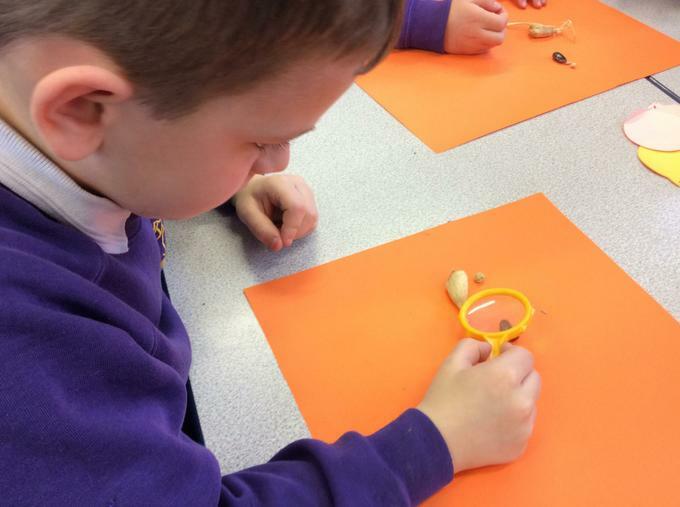 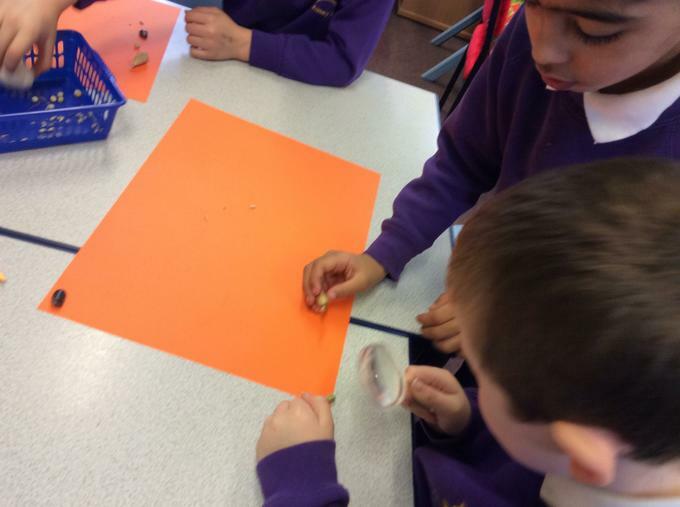 The children were given some objects to sort ( seeds and bulbs) and they were asked to think of ways to sort them. 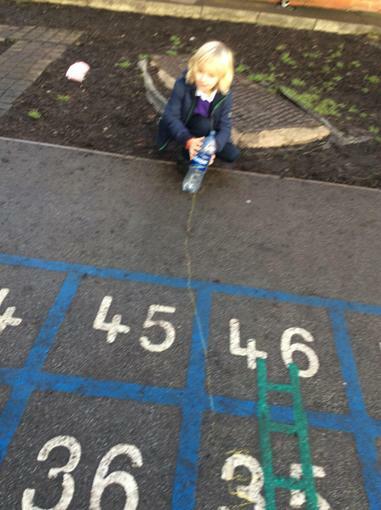 They had to think of their own criteria. 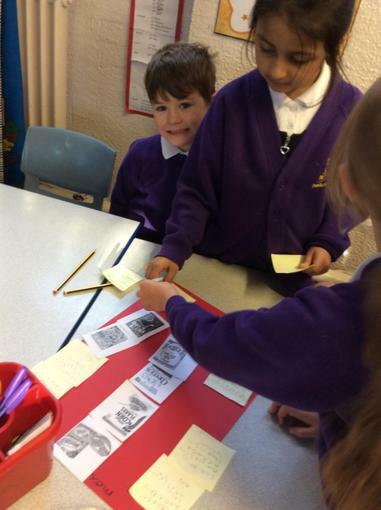 They worked in pairs. 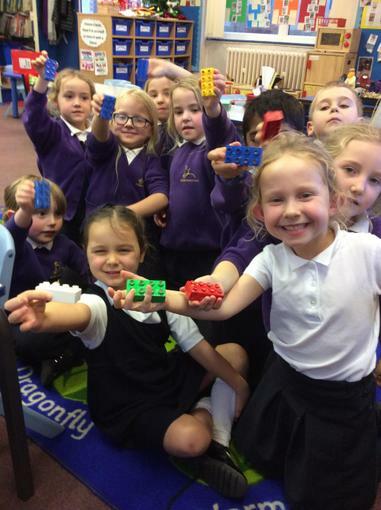 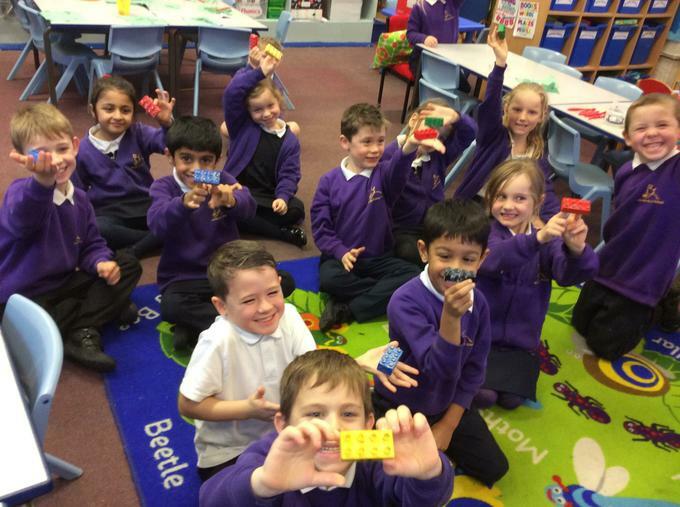 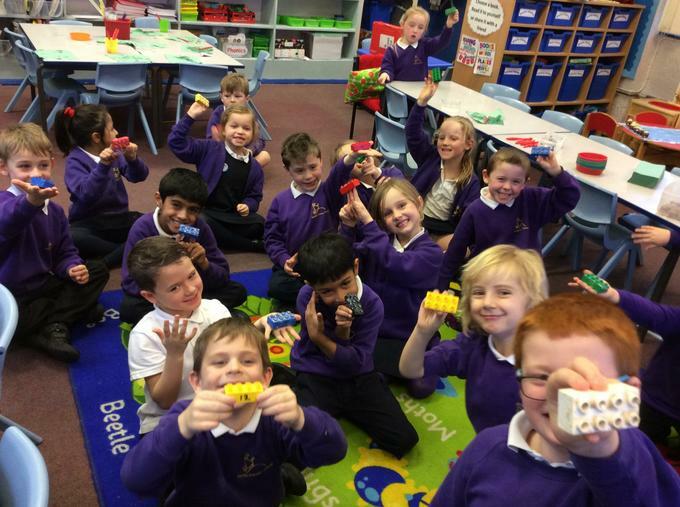 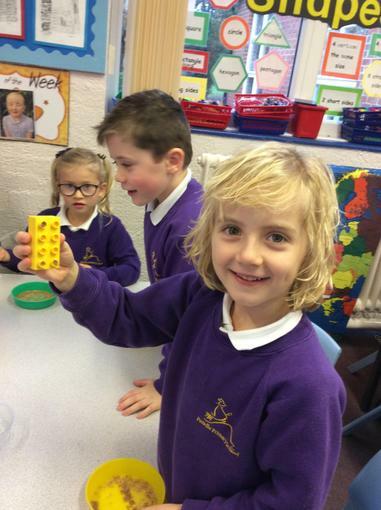 At first most children ordered the objects from the smallest to the biggest. 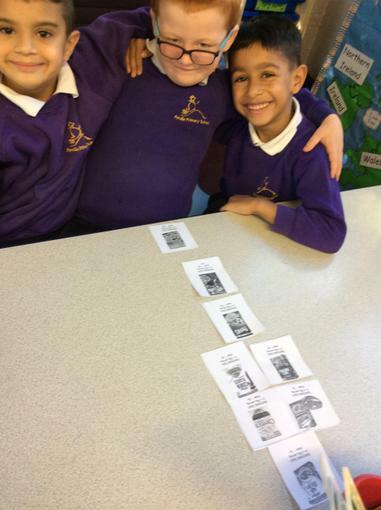 After some discussion they sorted them into big and small or big medium and small. 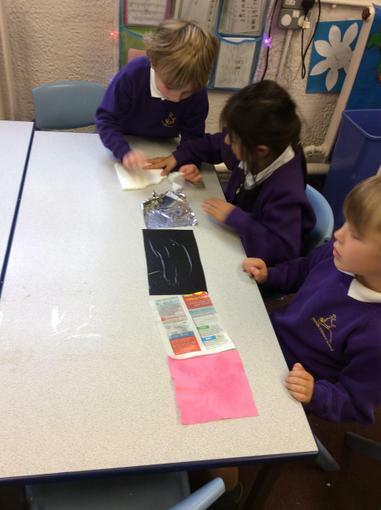 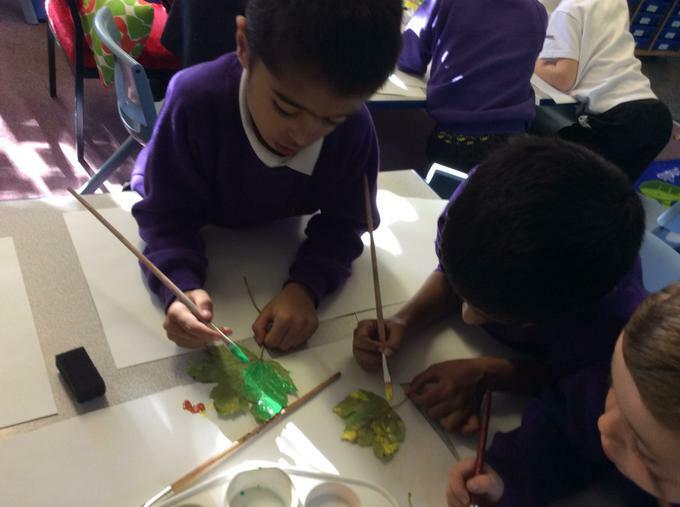 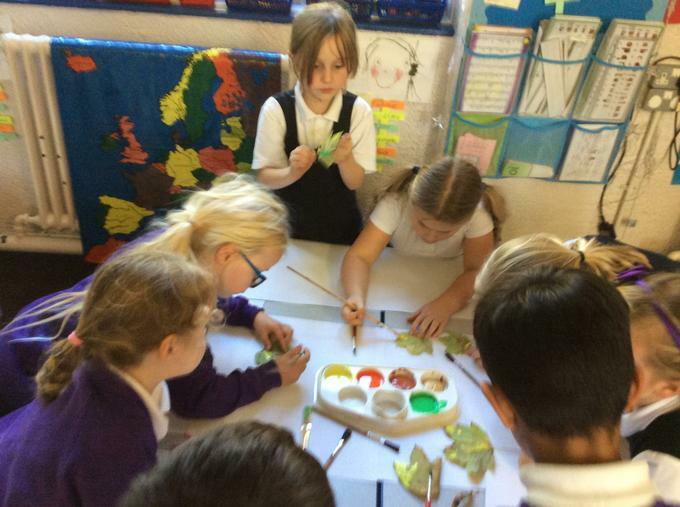 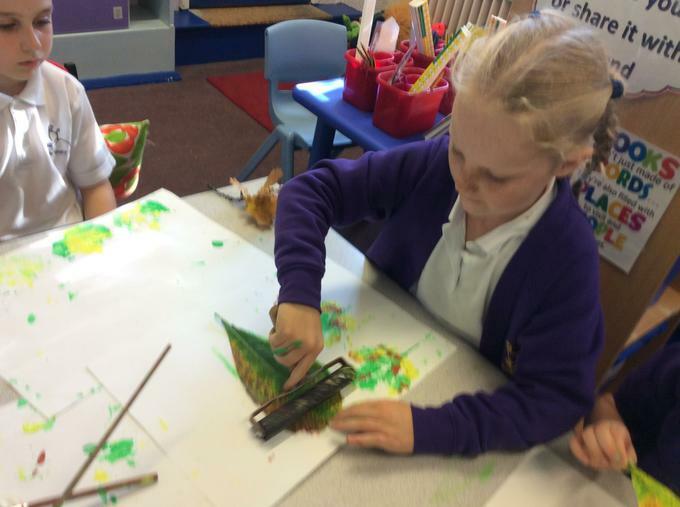 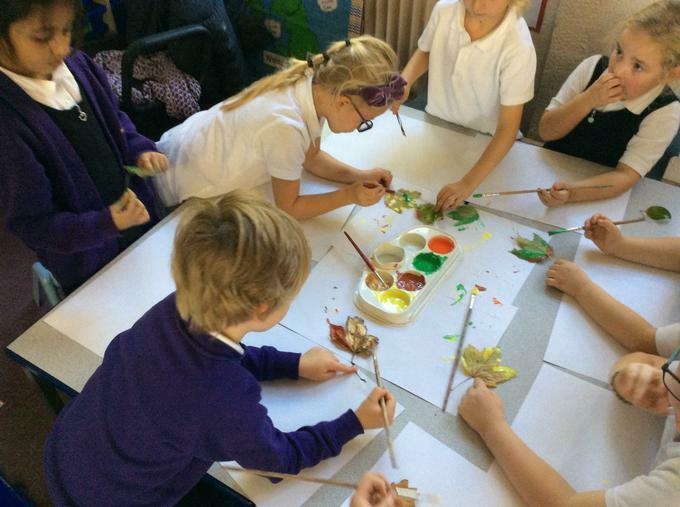 They were then asked to work together to sort for a different criteria.Between them all they came up with colour - light / dark, pattern - spotty/ stripy, texture - bumpy/ smooth and shape long /round. 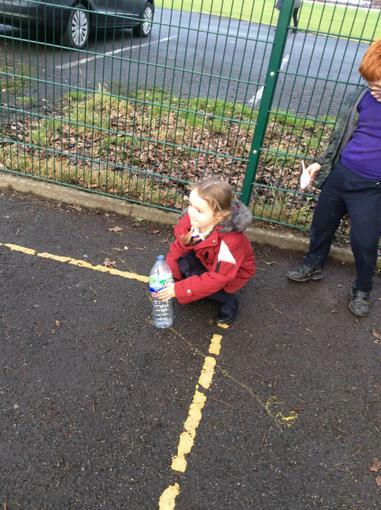 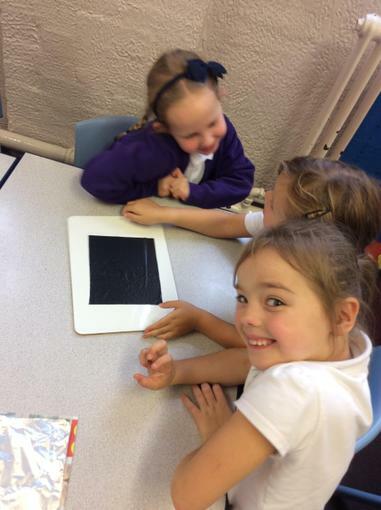 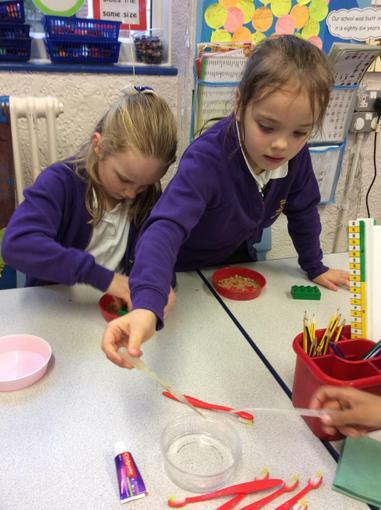 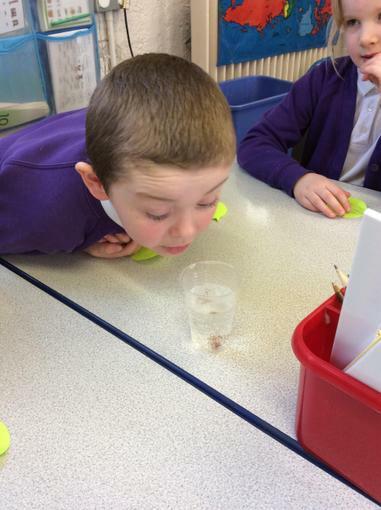 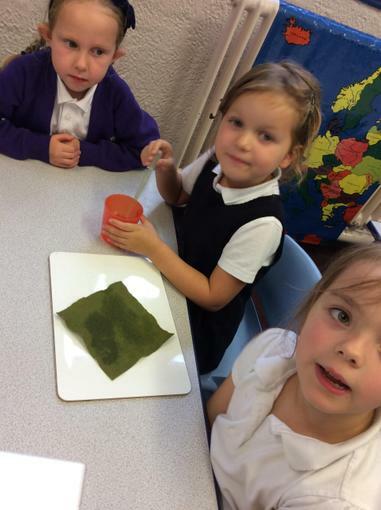 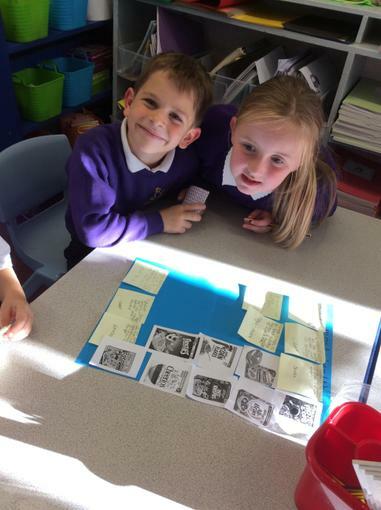 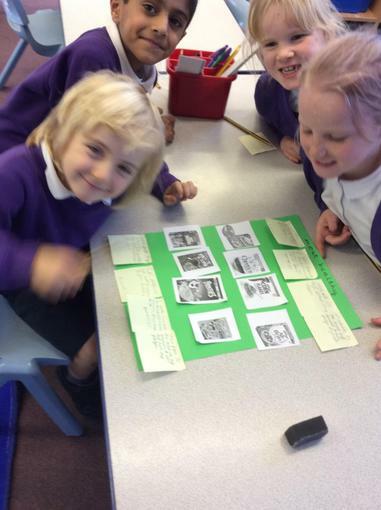 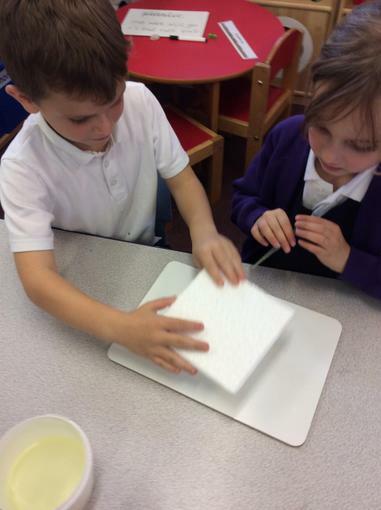 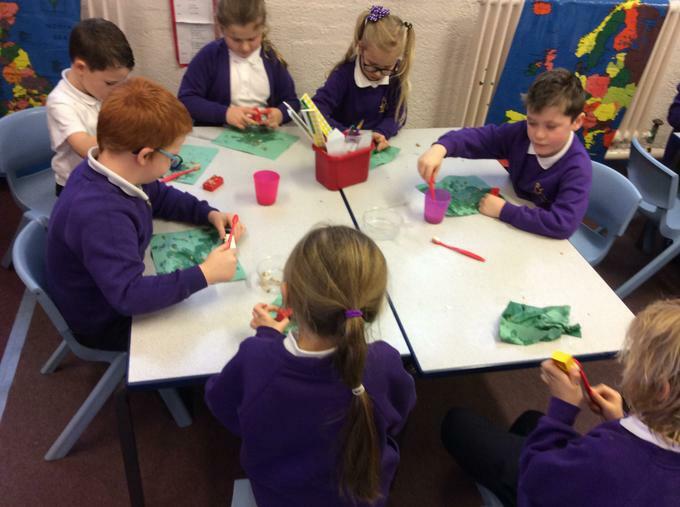 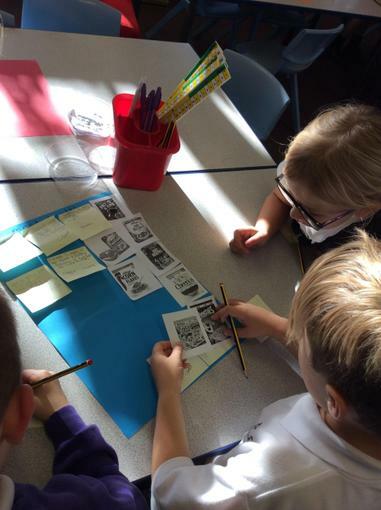 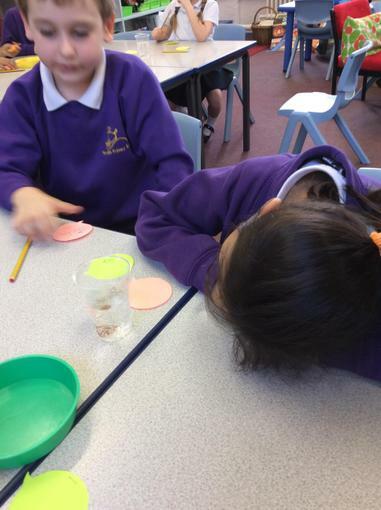 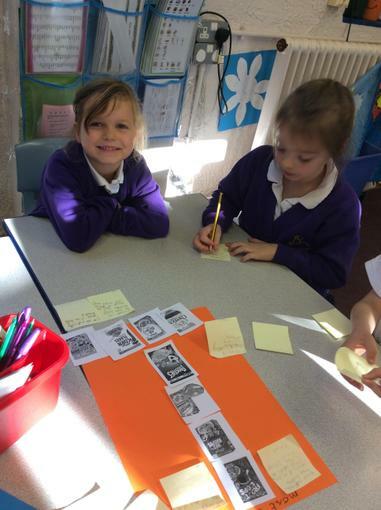 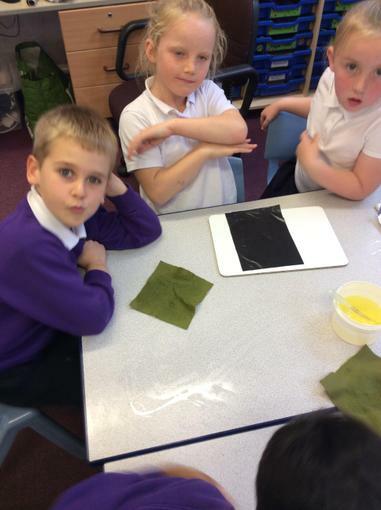 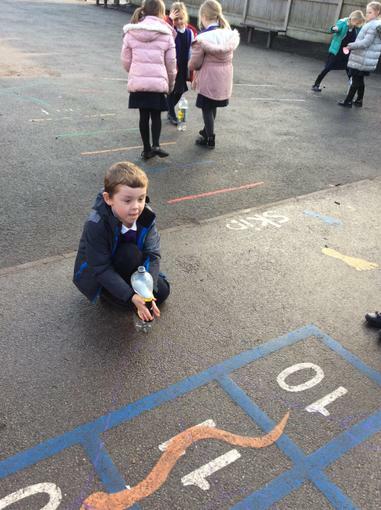 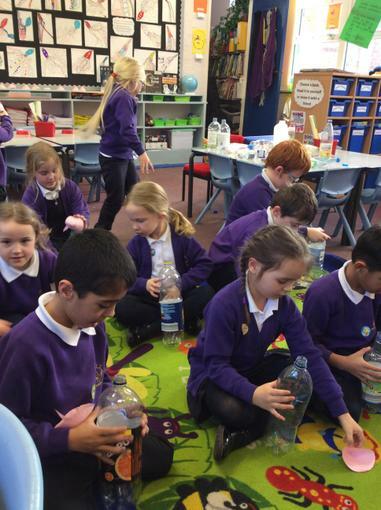 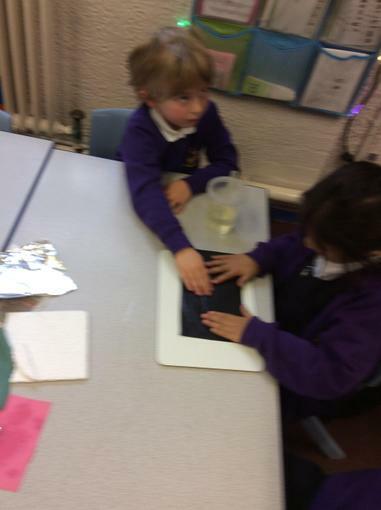 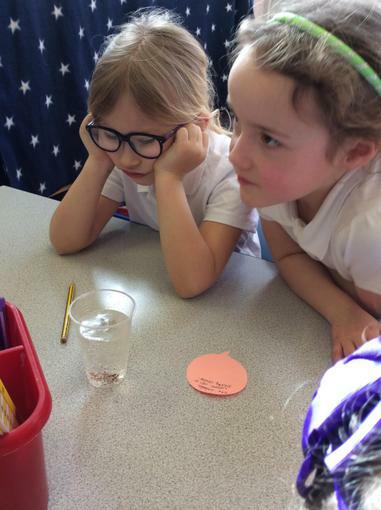 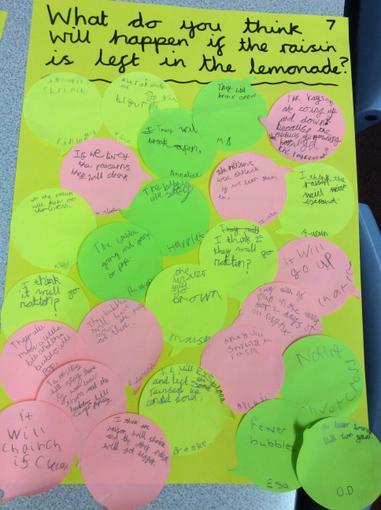 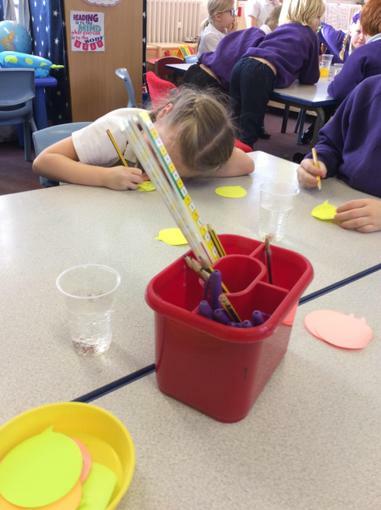 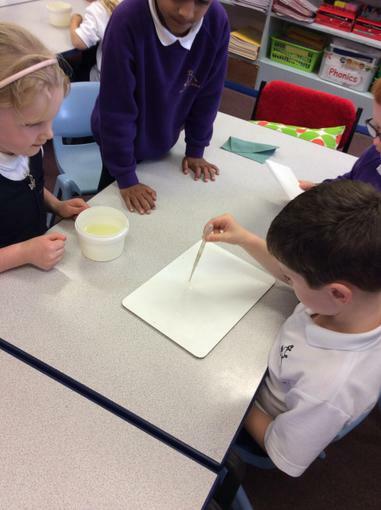 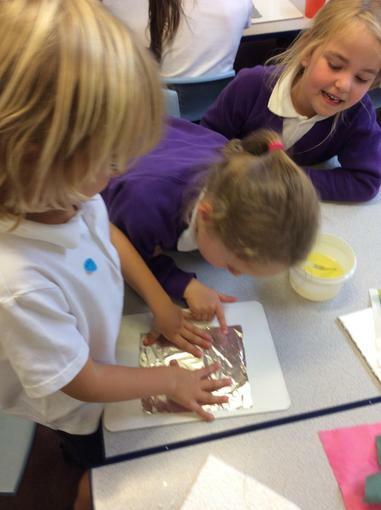 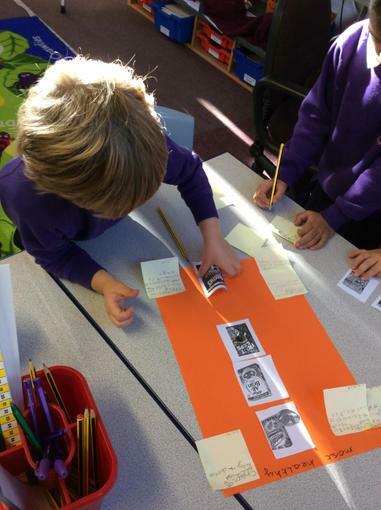 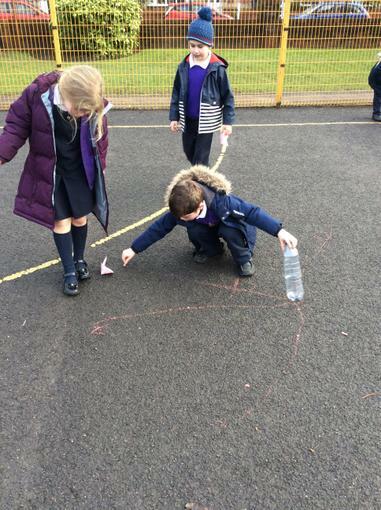 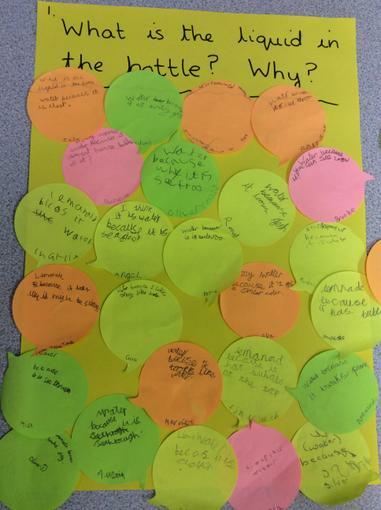 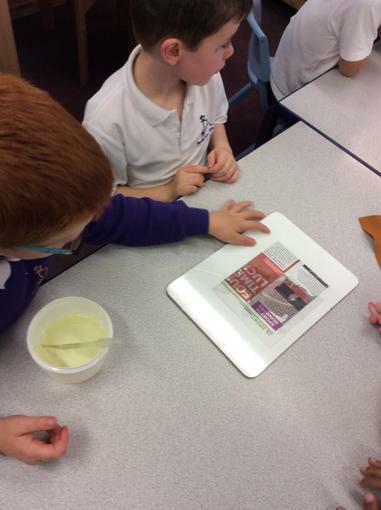 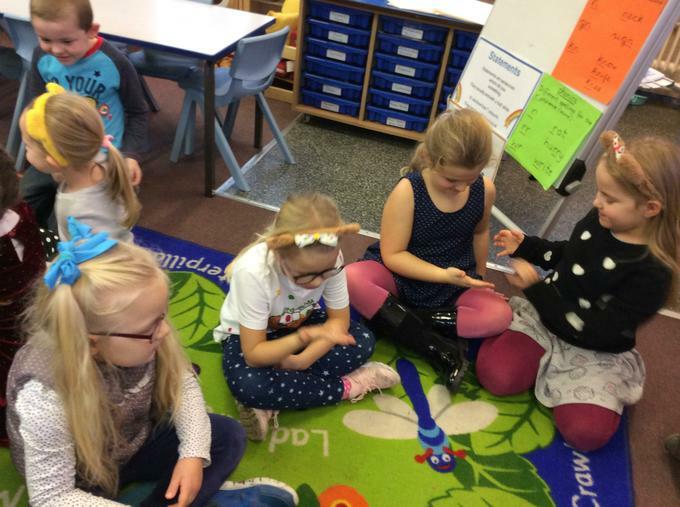 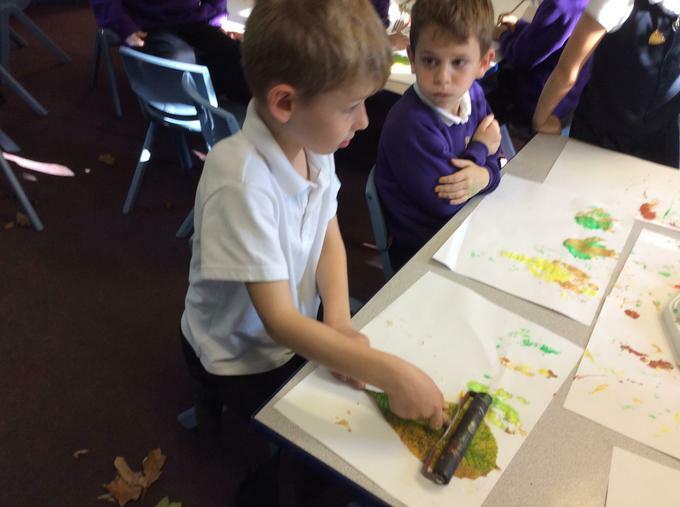 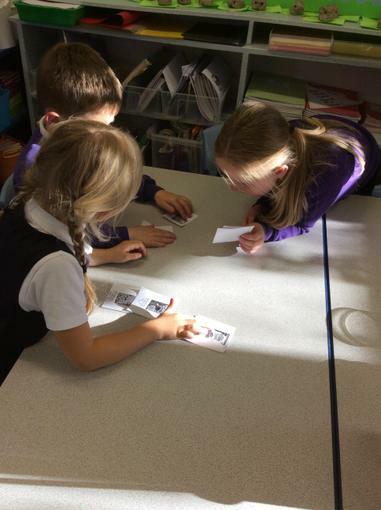 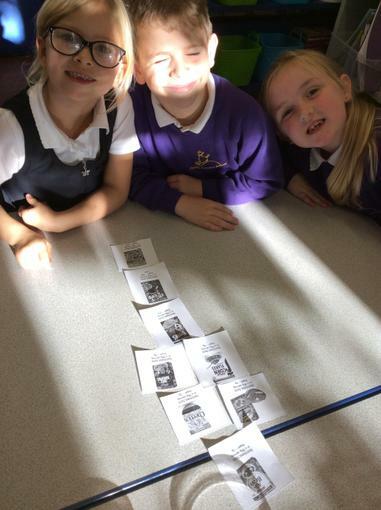 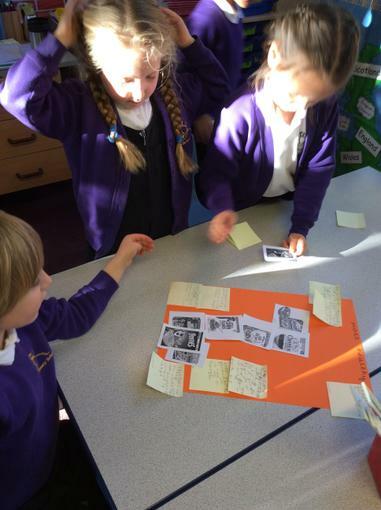 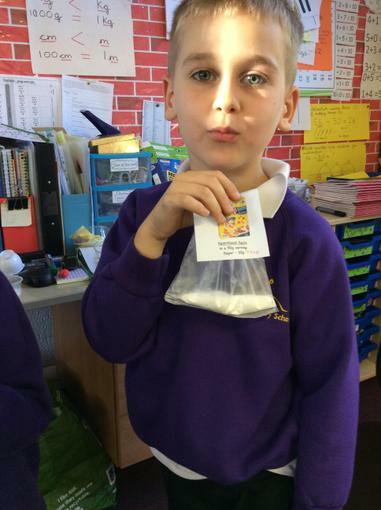 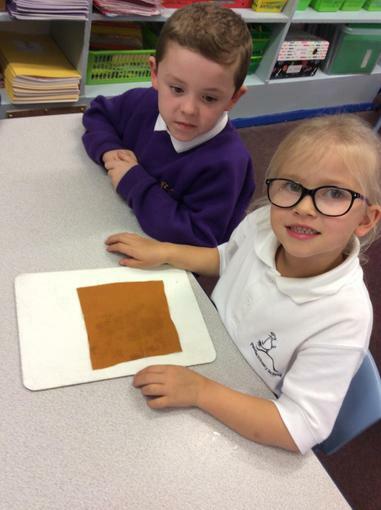 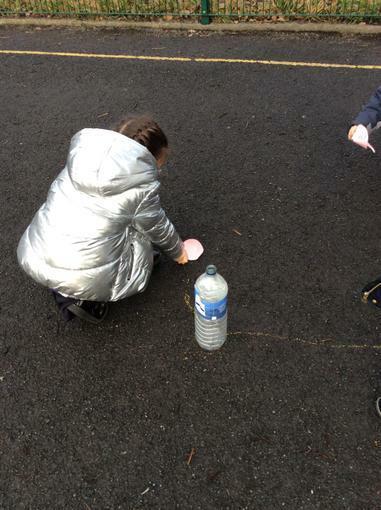 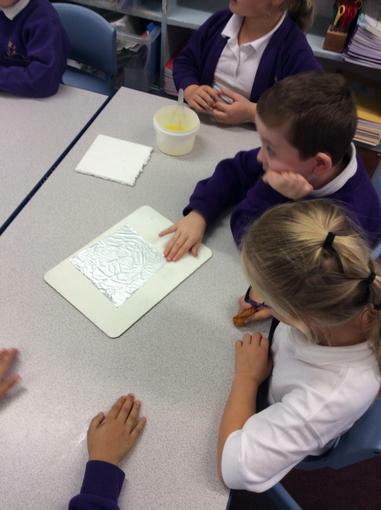 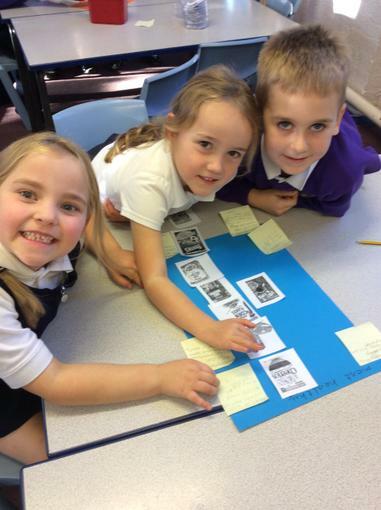 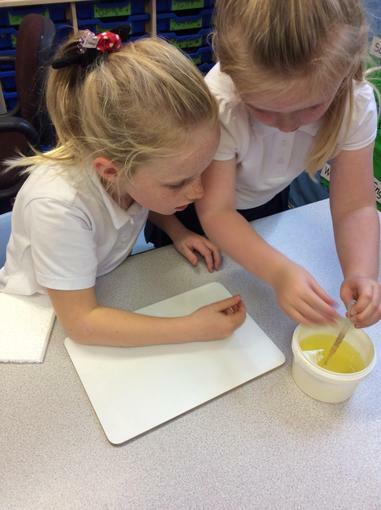 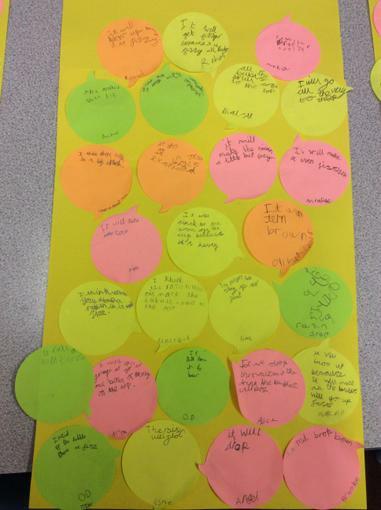 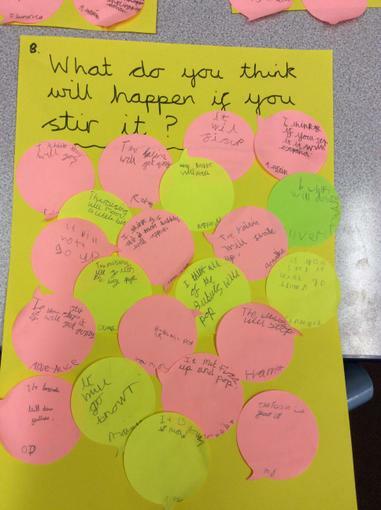 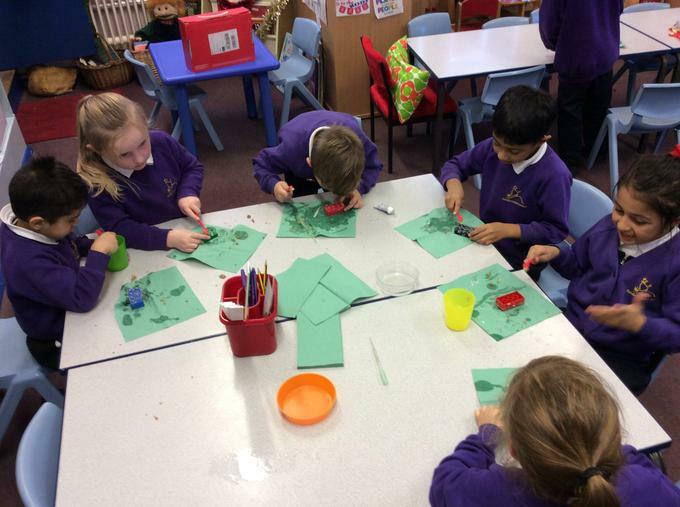 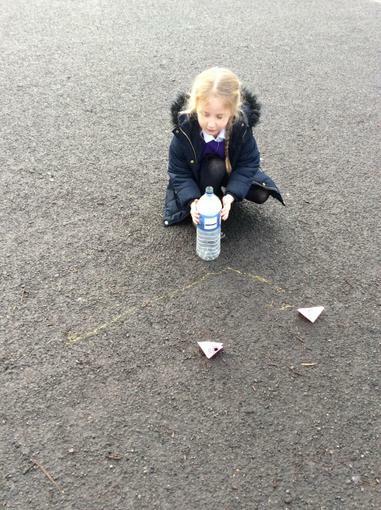 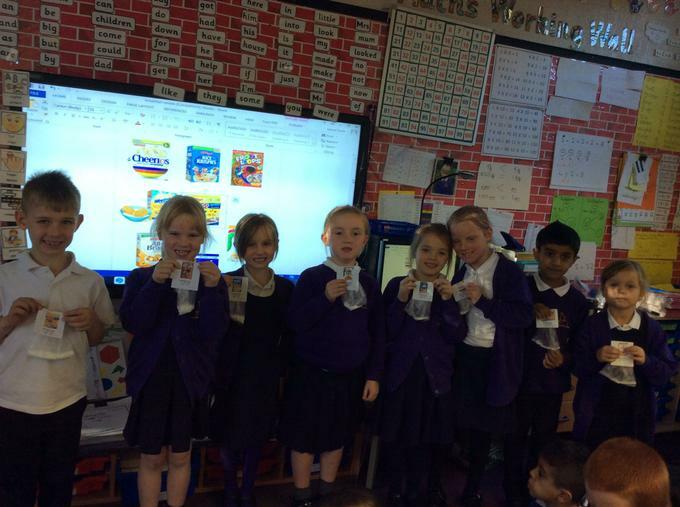 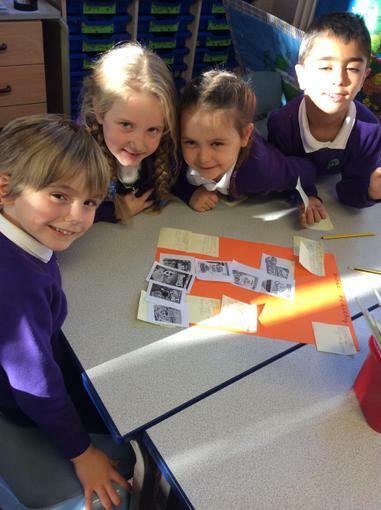 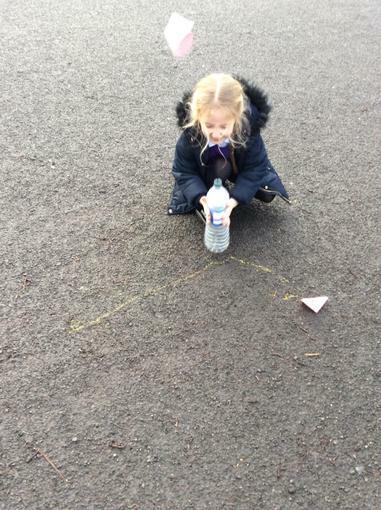 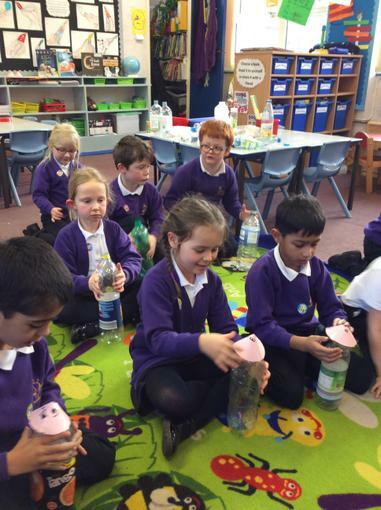 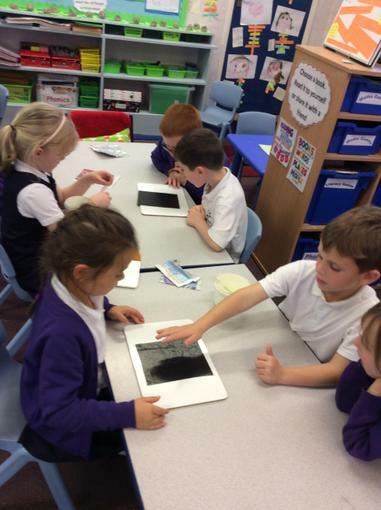 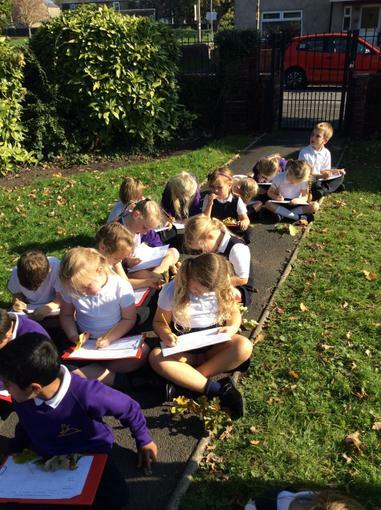 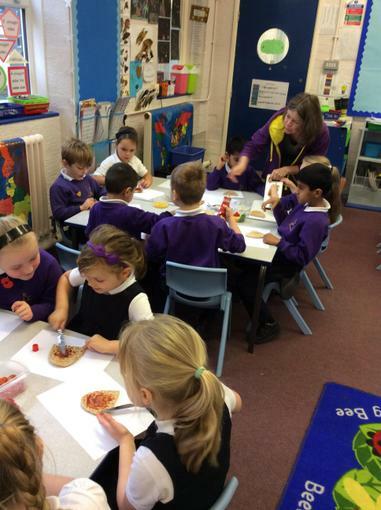 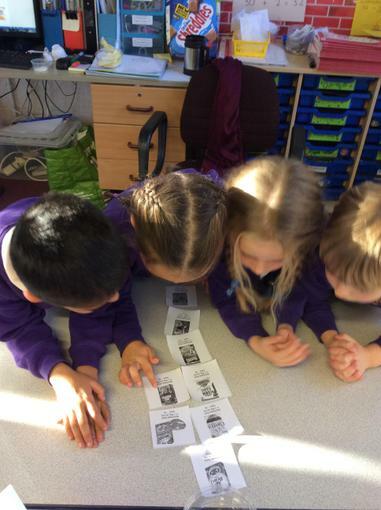 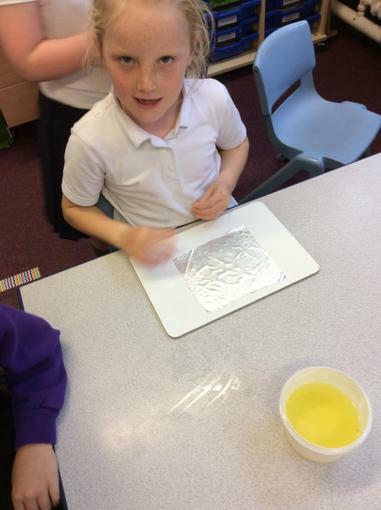 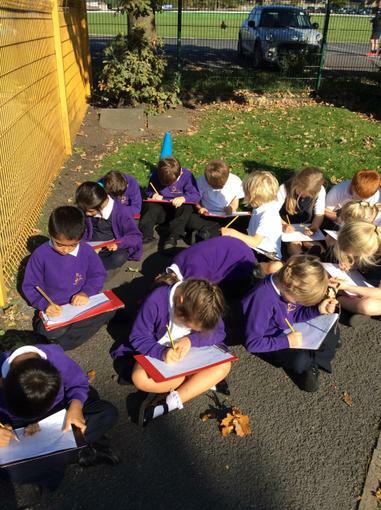 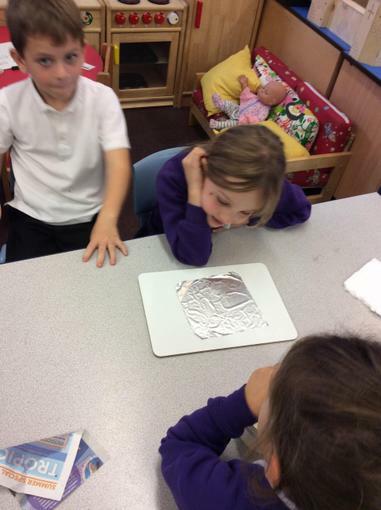 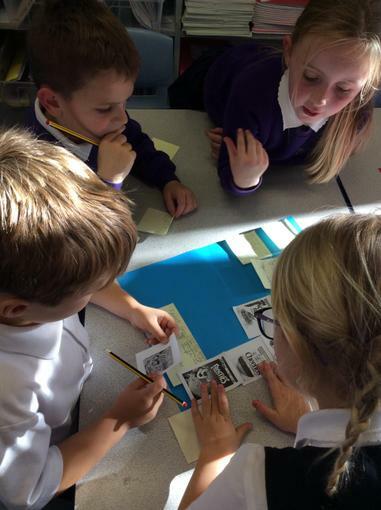 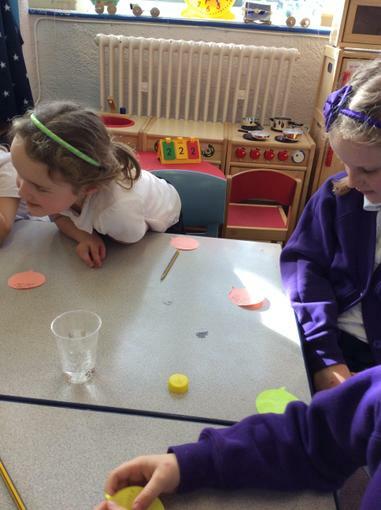 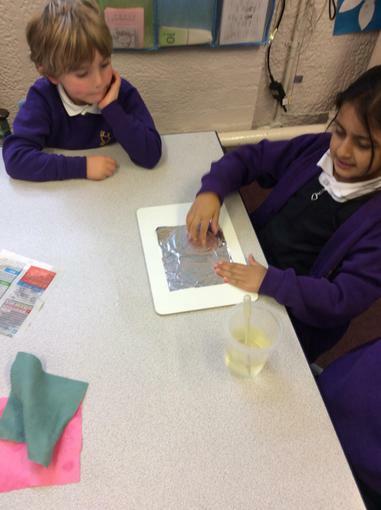 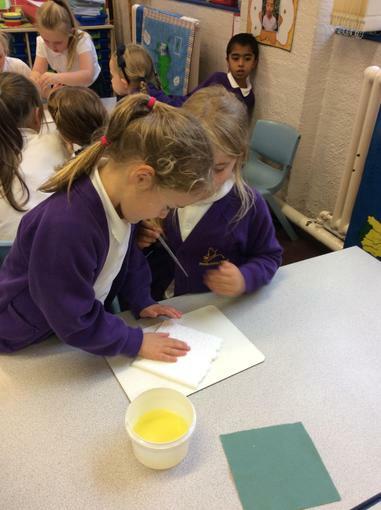 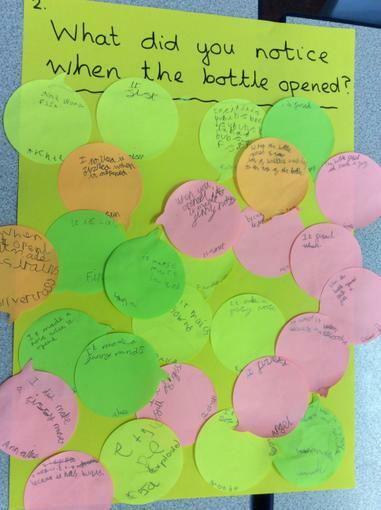 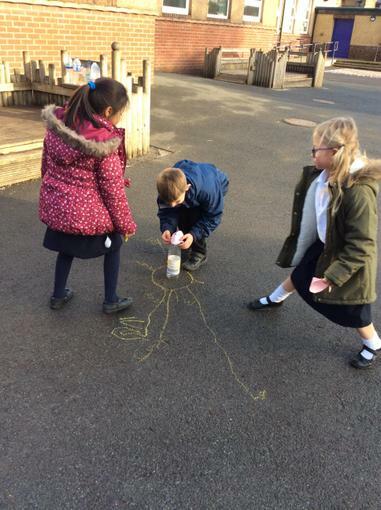 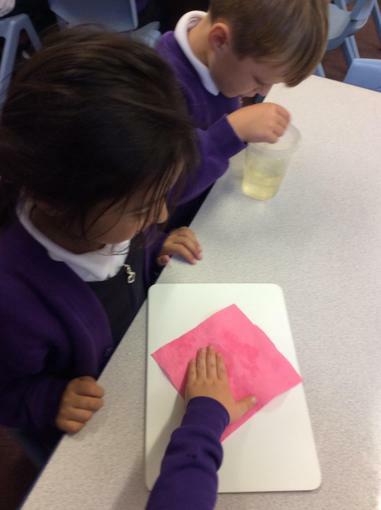 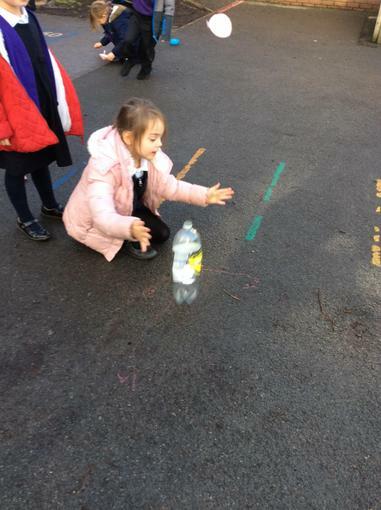 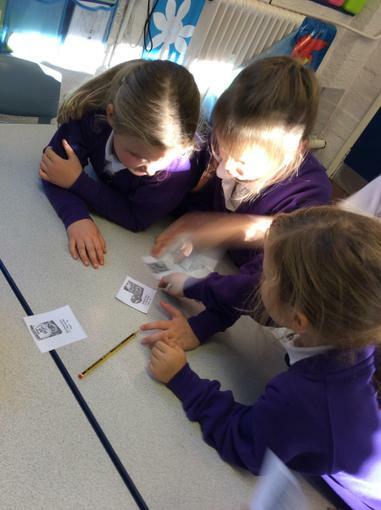 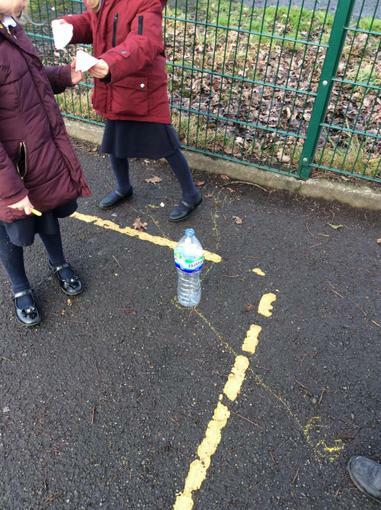 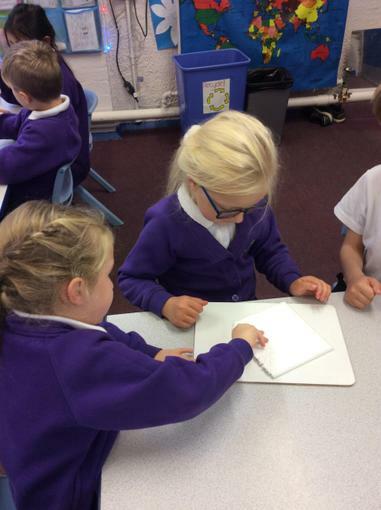 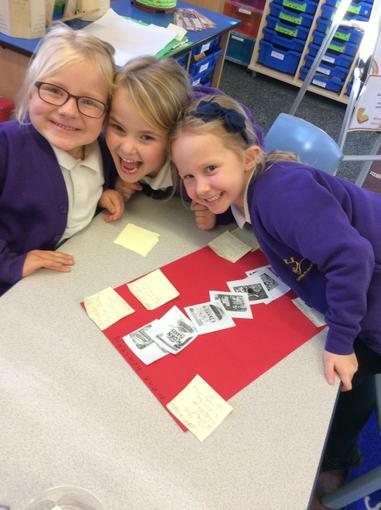 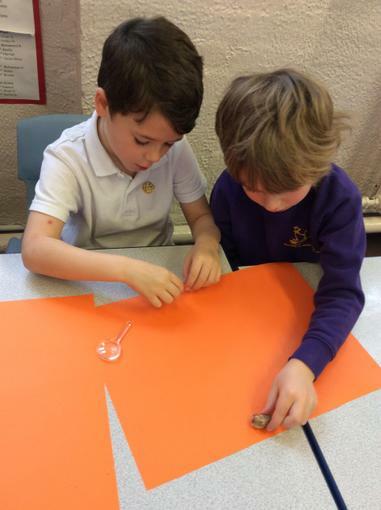 The children looked at a bottle of clear liquid then predicted what was in it giving their reasons. 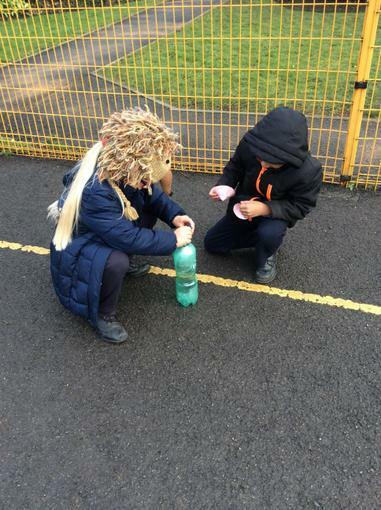 The bottle was opened and a hissing sound was heard. 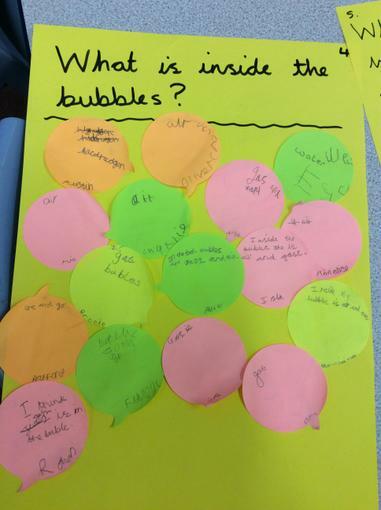 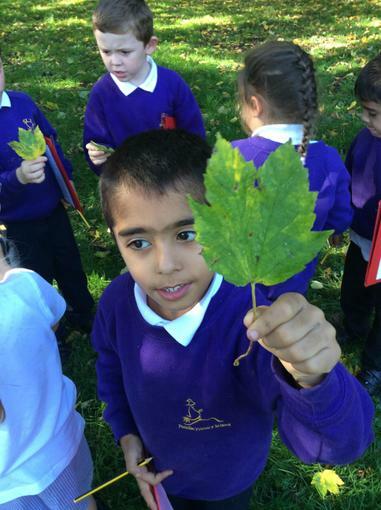 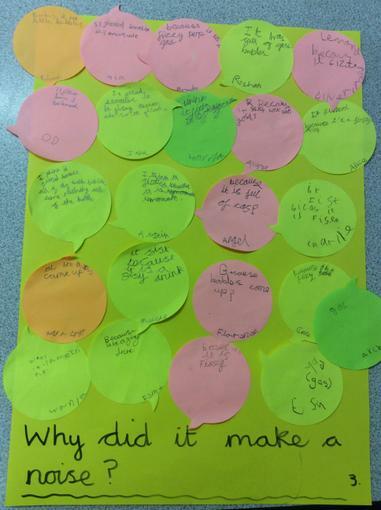 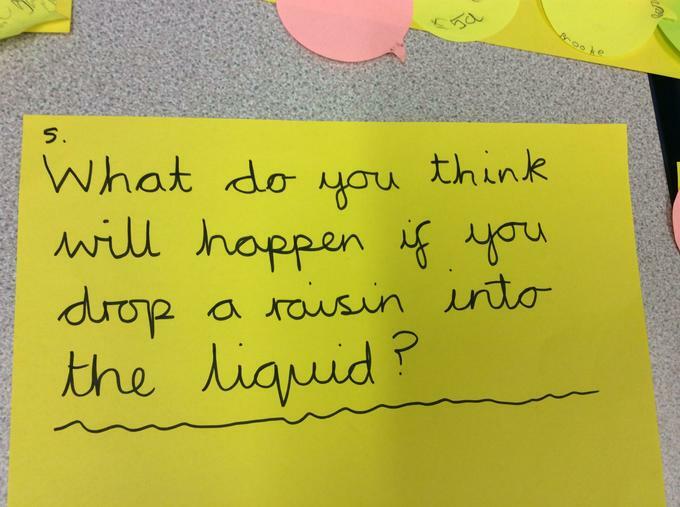 The children were asked to explain why it made that sound. 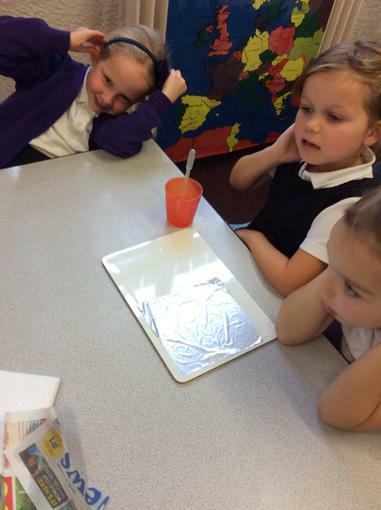 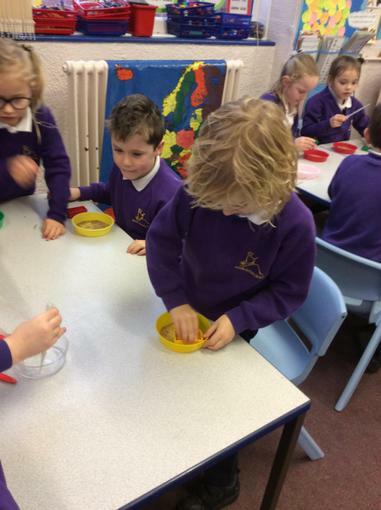 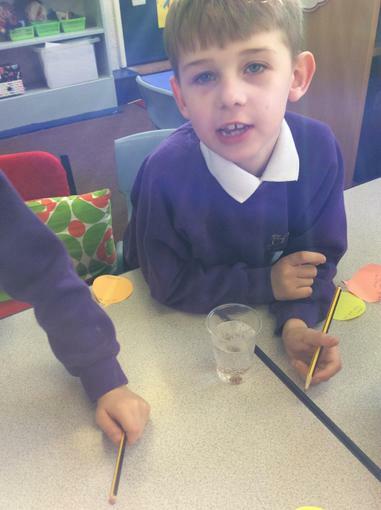 The lemonade was poured into transparent cups then the children had to predict what would happen if raisins were added. 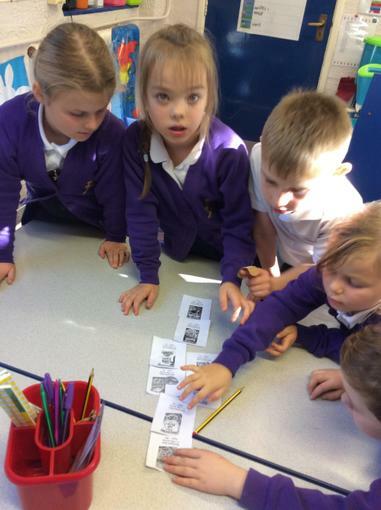 They then had to describe and explain what actually happened. 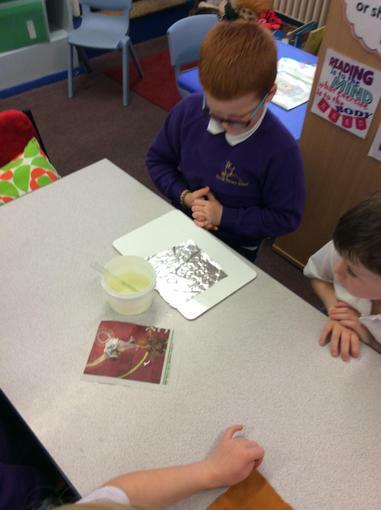 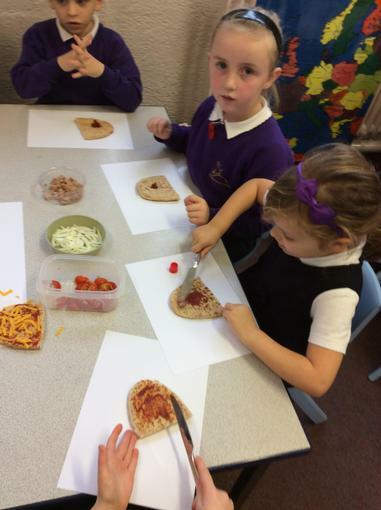 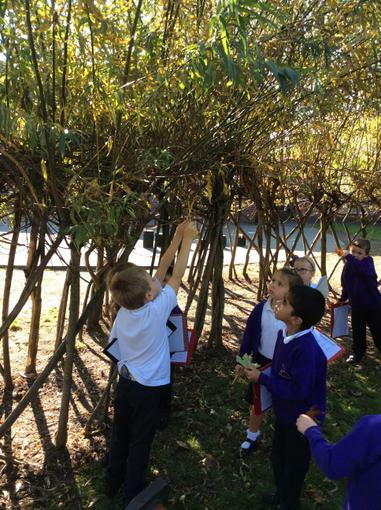 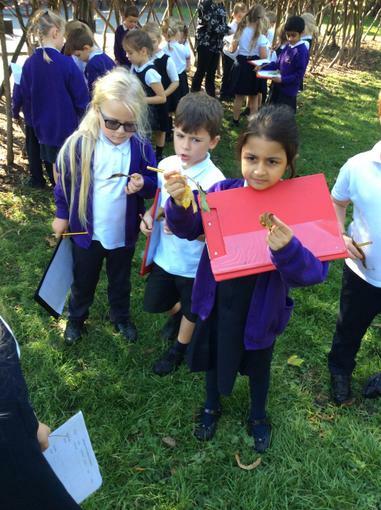 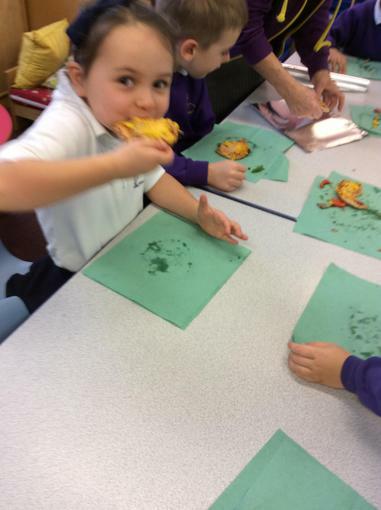 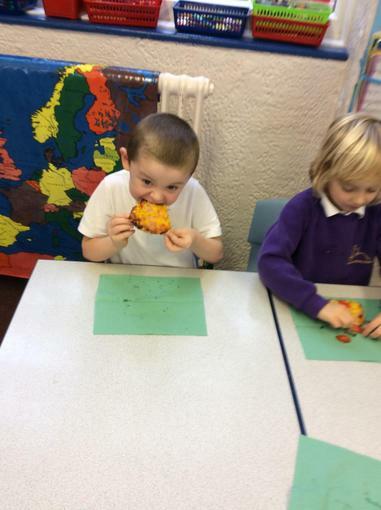 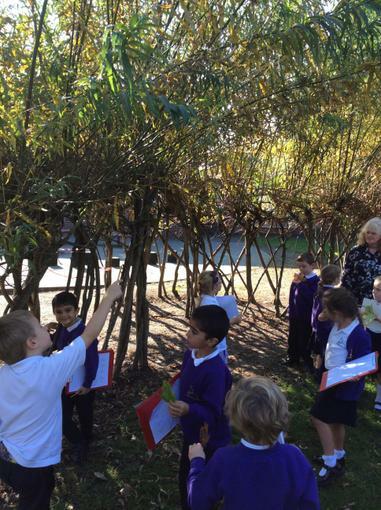 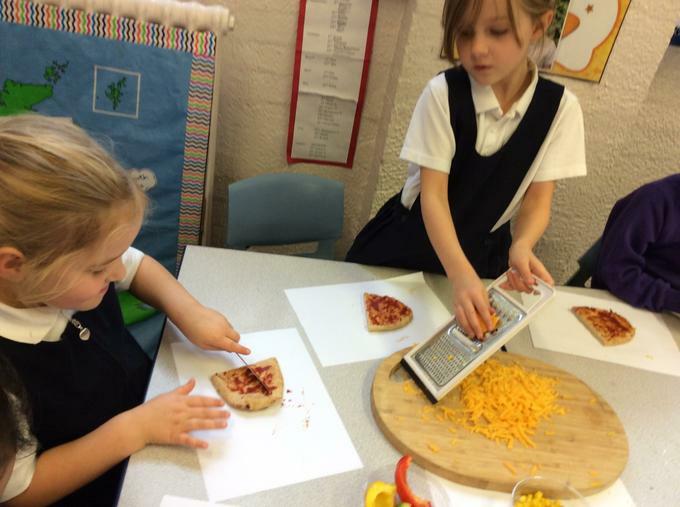 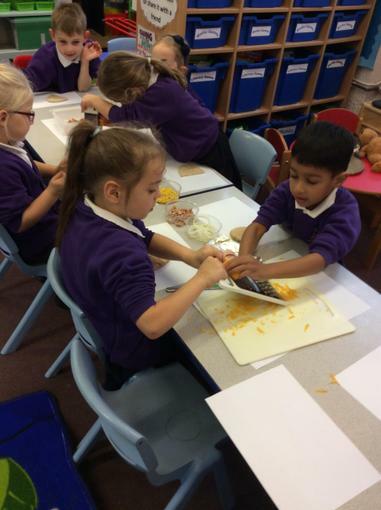 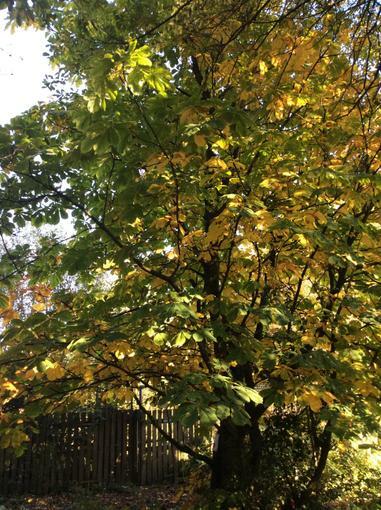 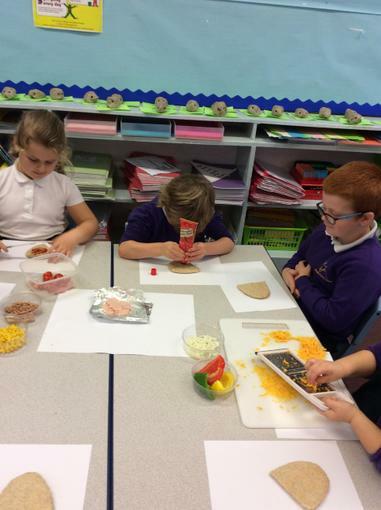 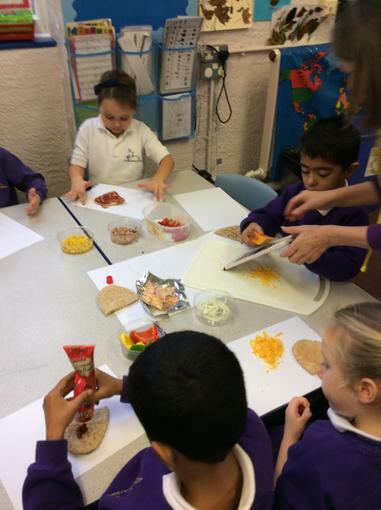 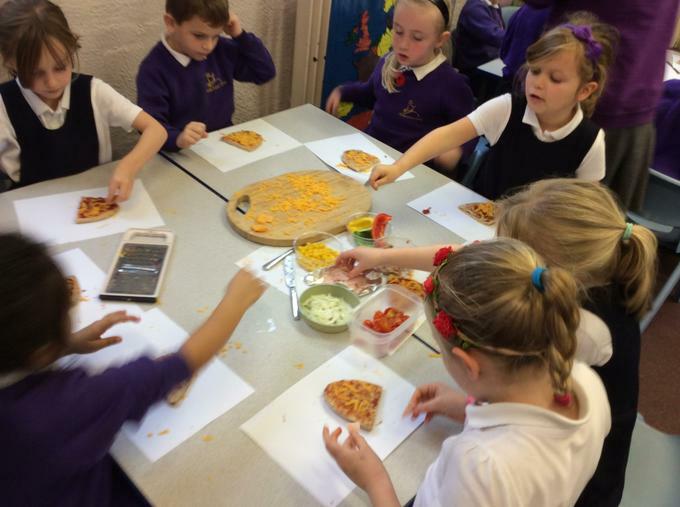 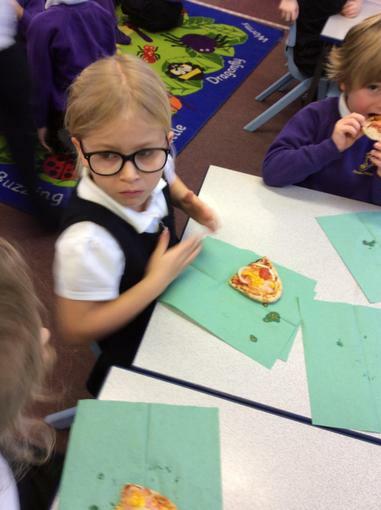 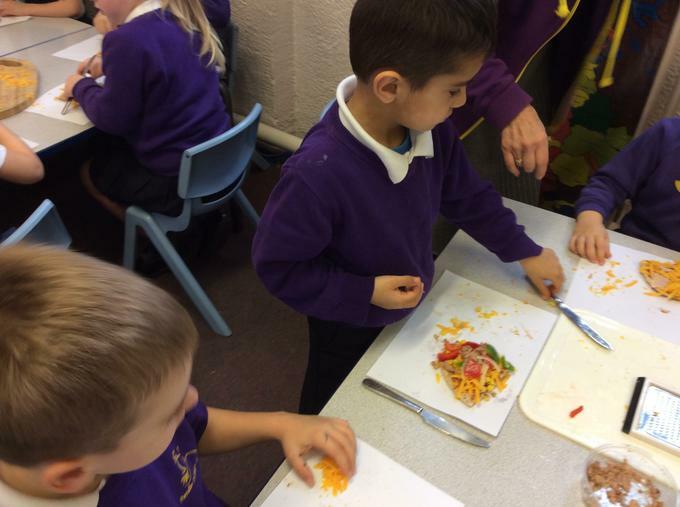 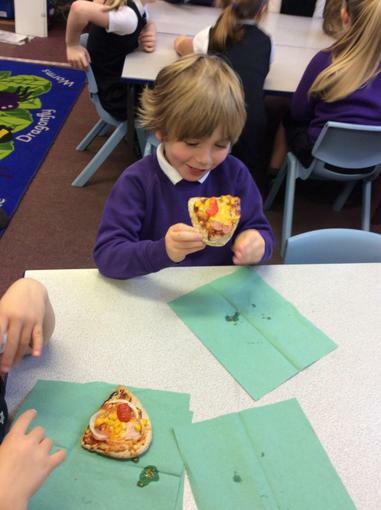 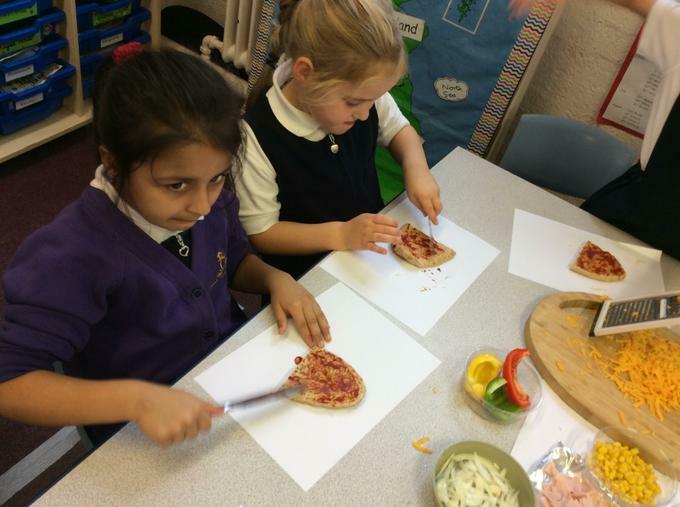 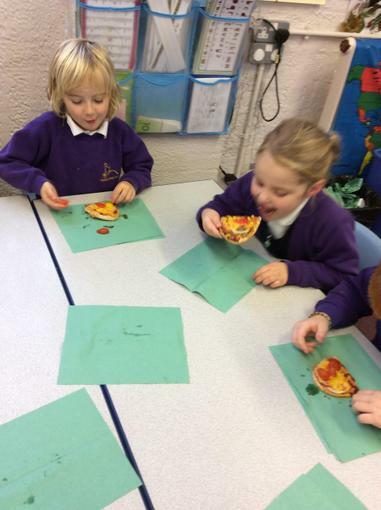 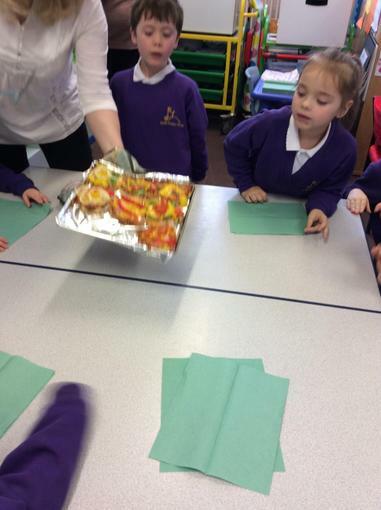 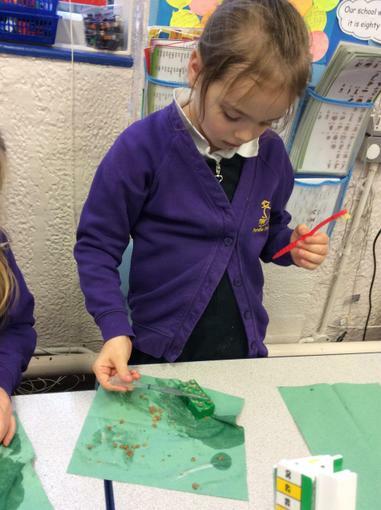 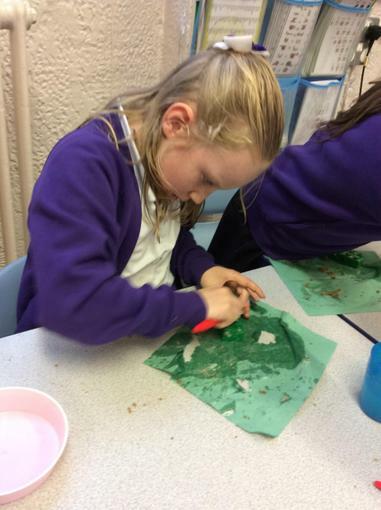 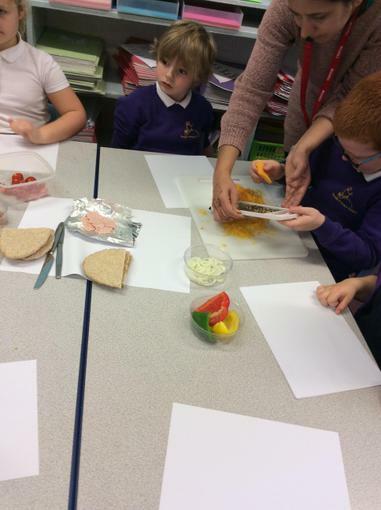 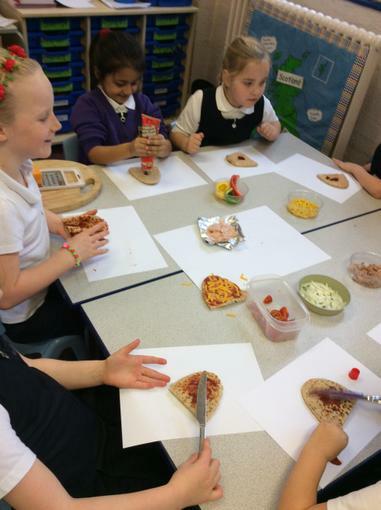 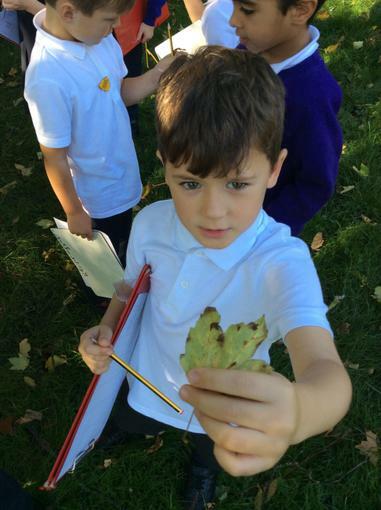 Further predictions and tests observations were carried out. 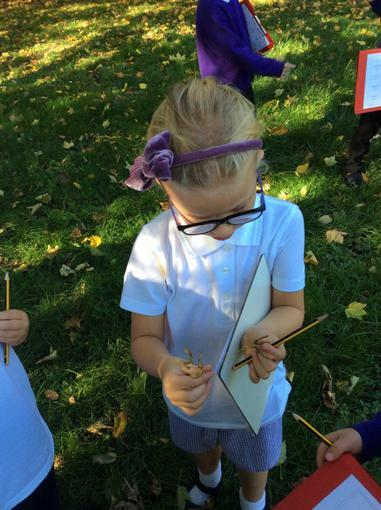 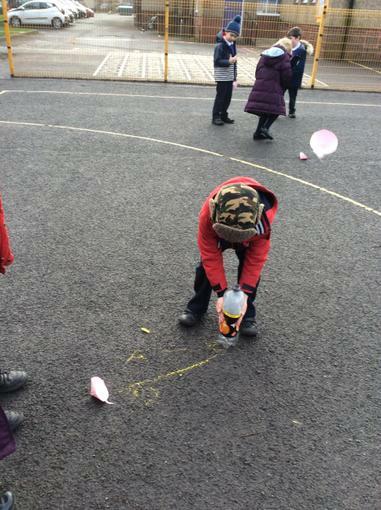 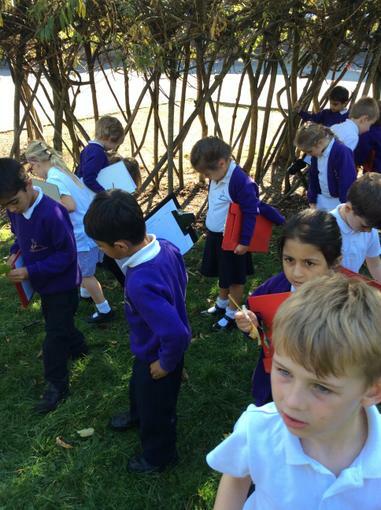 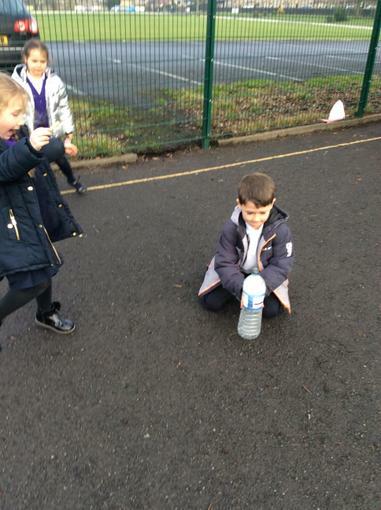 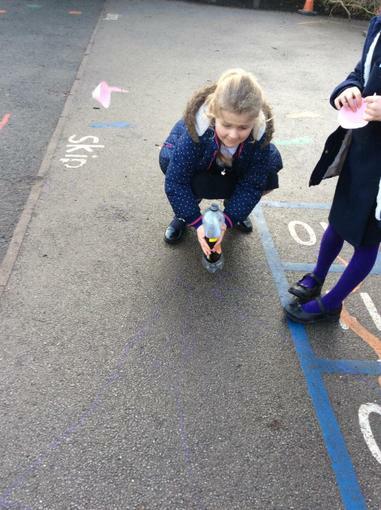 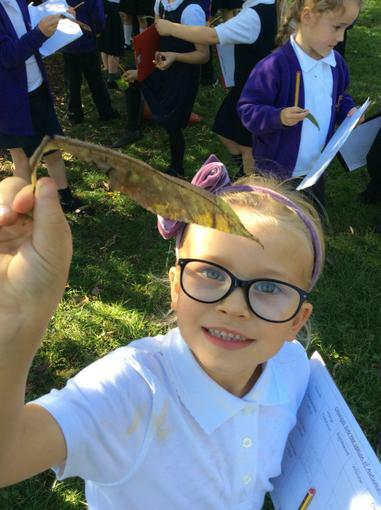 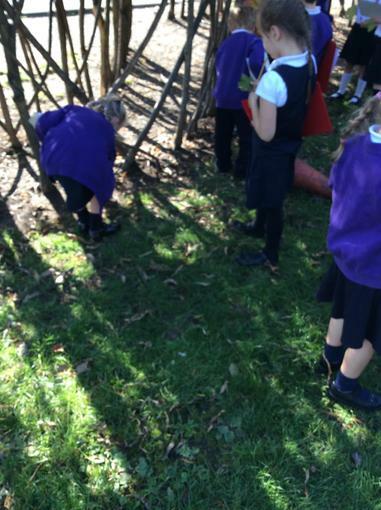 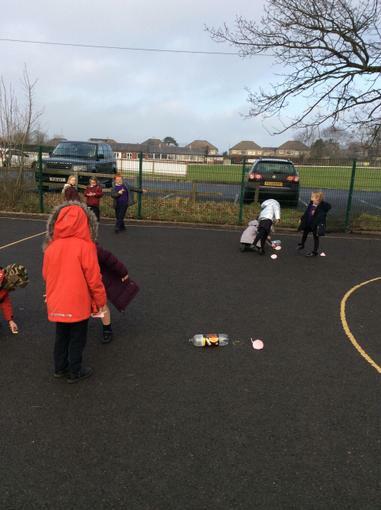 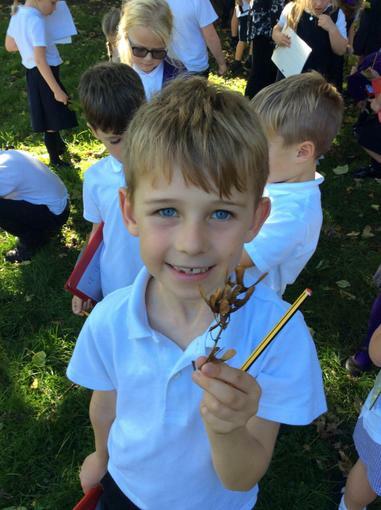 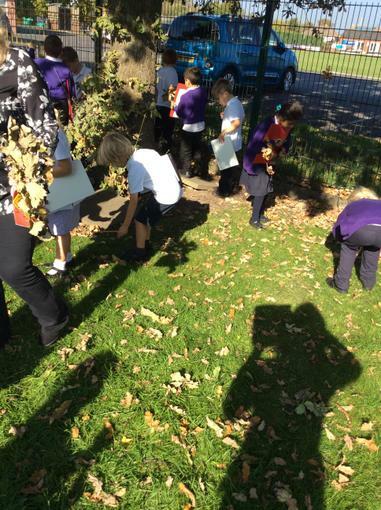 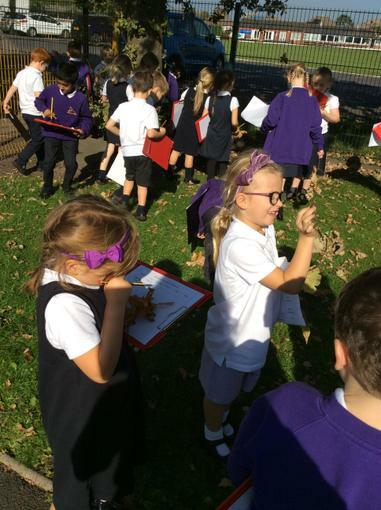 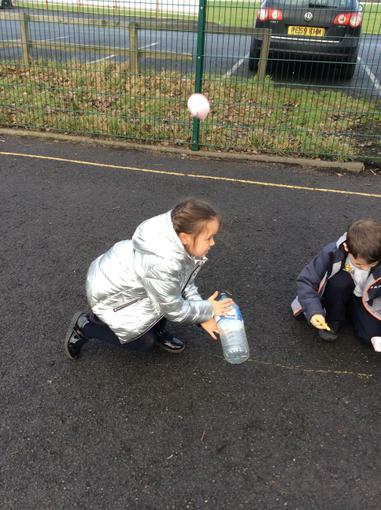 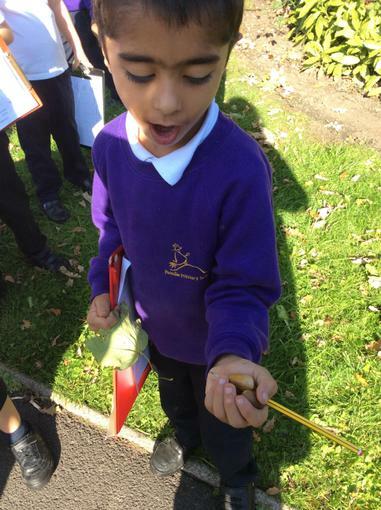 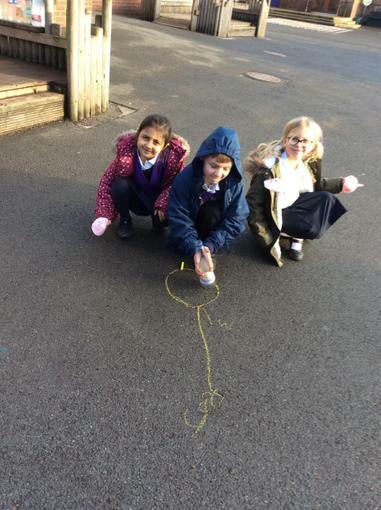 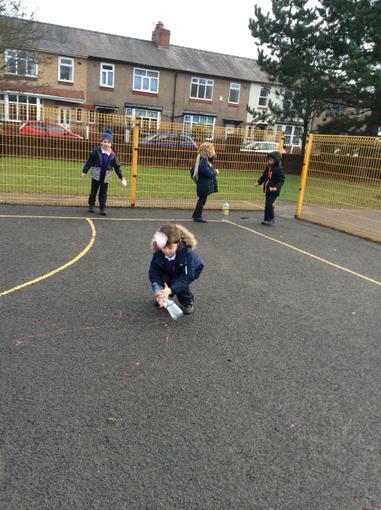 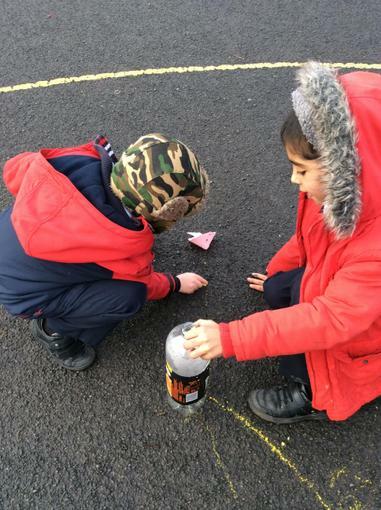 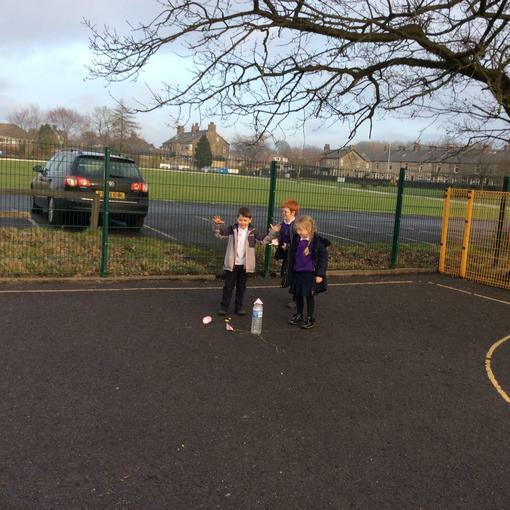 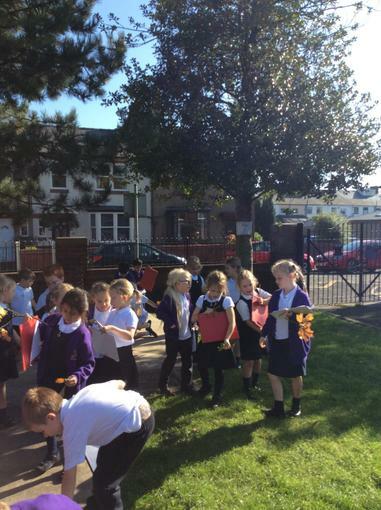 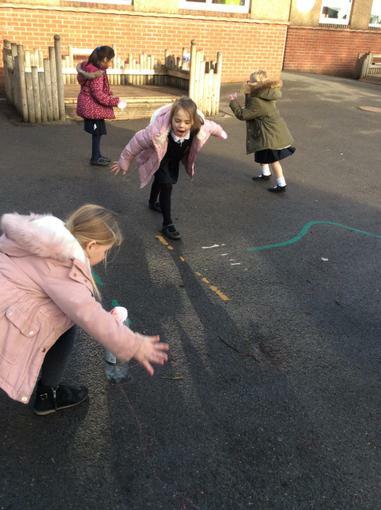 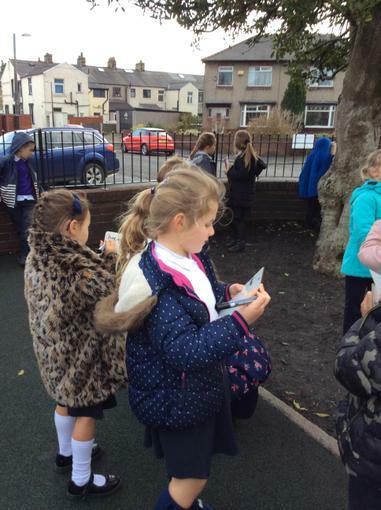 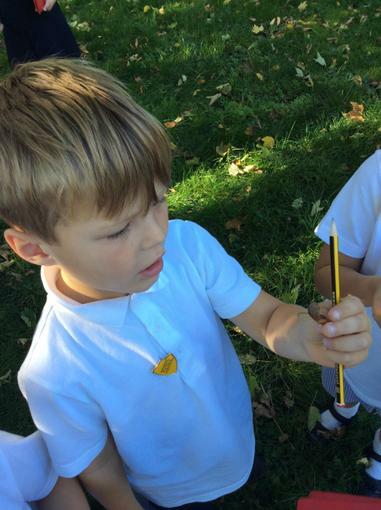 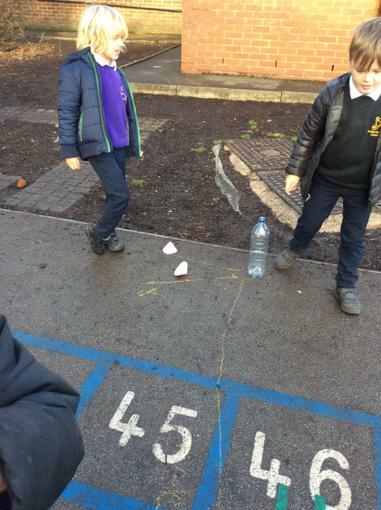 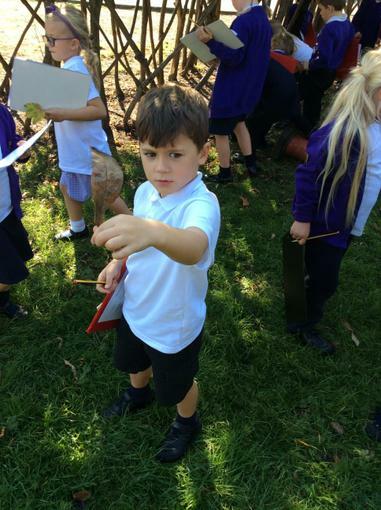 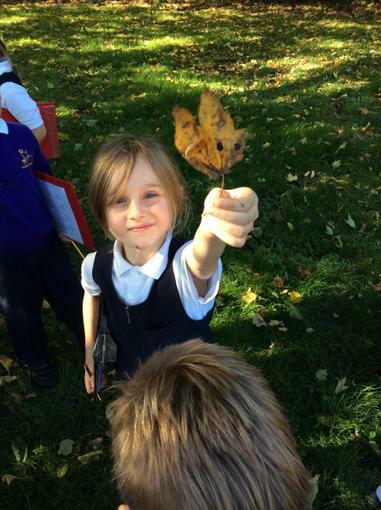 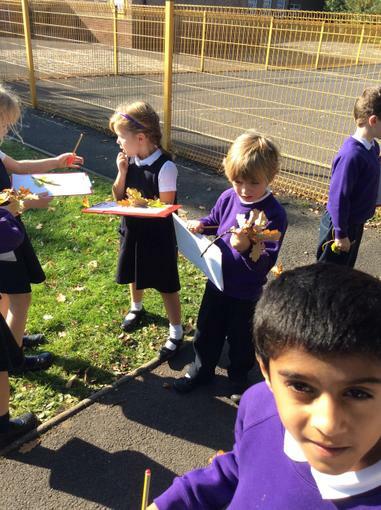 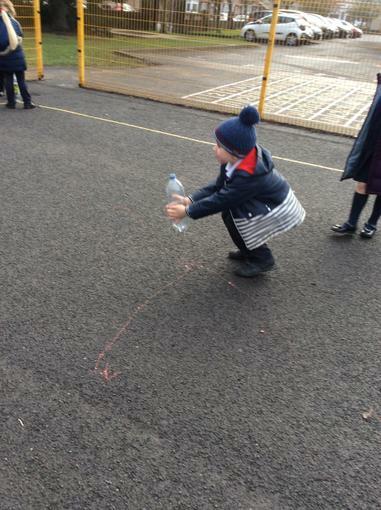 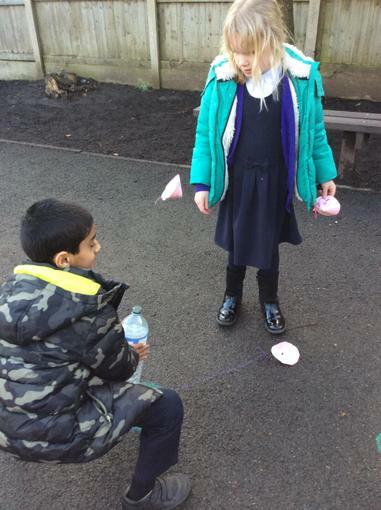 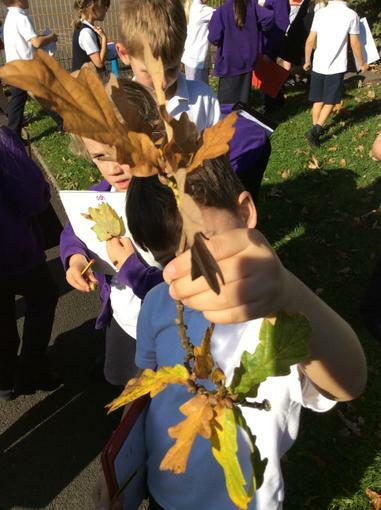 We made Rocket Mice and went outside to launch them! 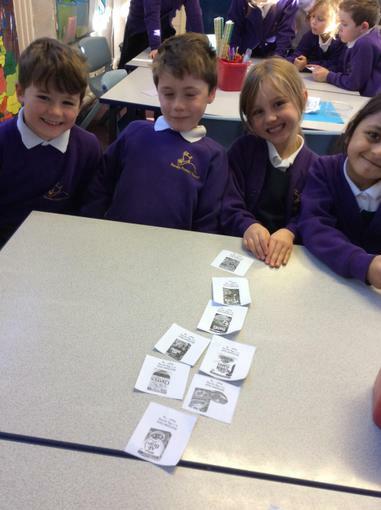 We worked in groups of three finding who'se mouse went the furthest, recording the distances on a floor graph. 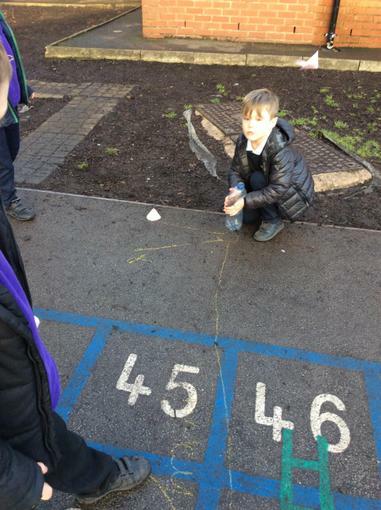 We measured the distance each mouse travelled then thought about how we could make the mouse go even further. 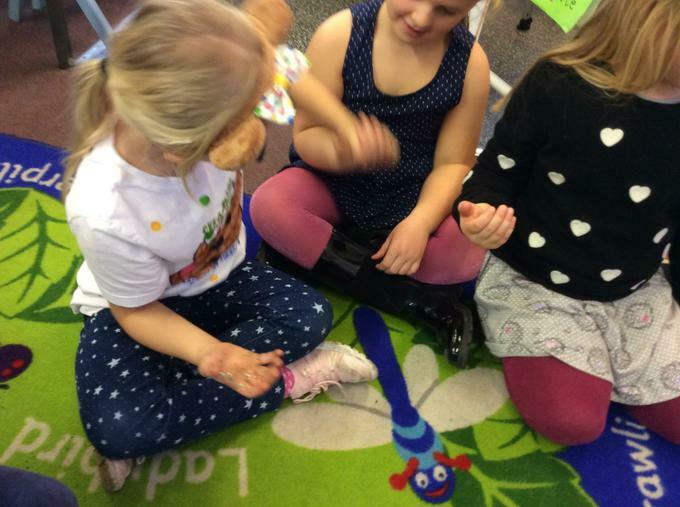 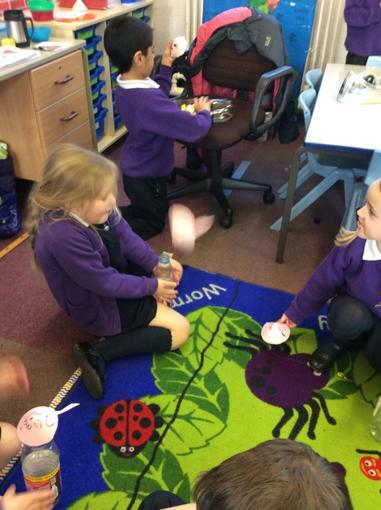 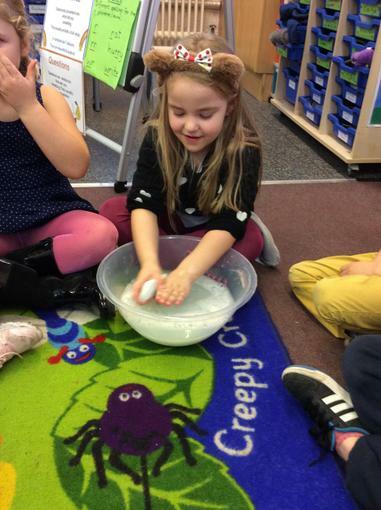 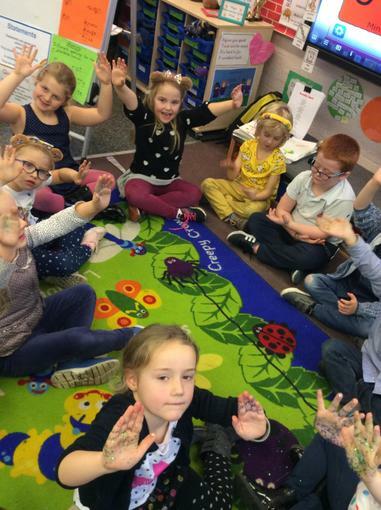 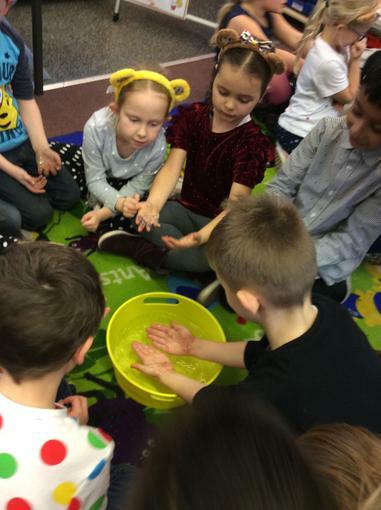 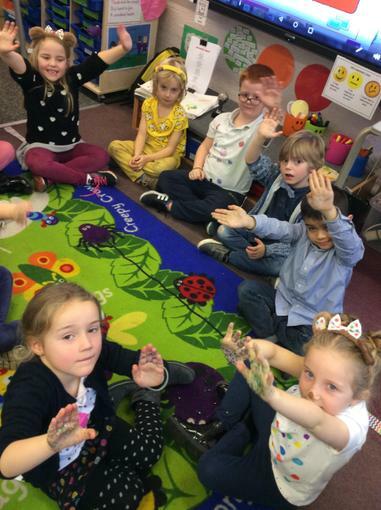 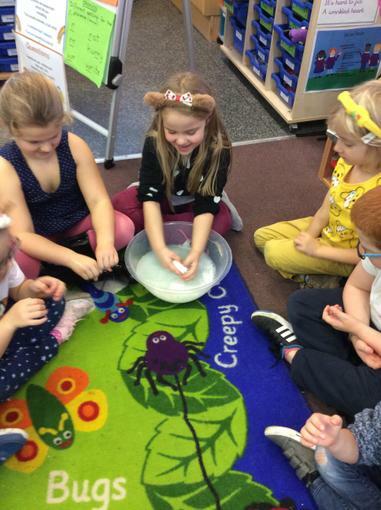 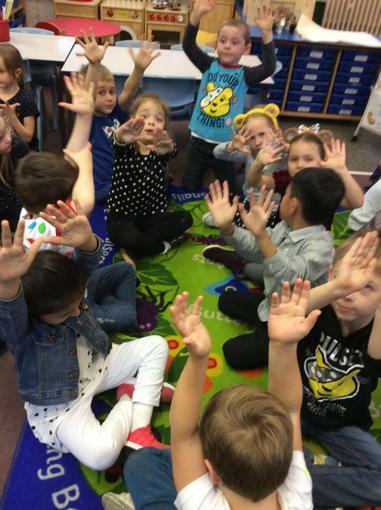 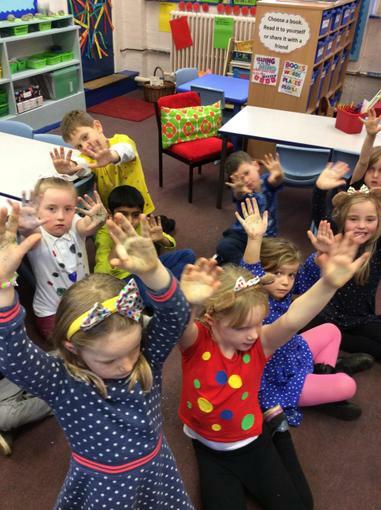 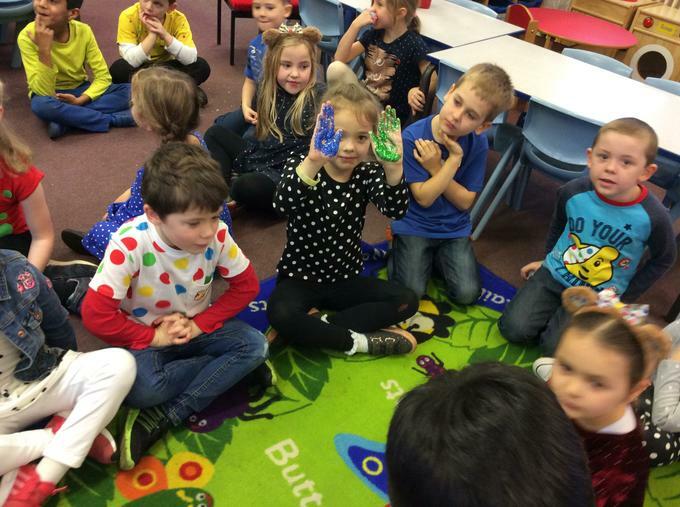 We found out how easily germs can be passed on by shaking hands around a circle. 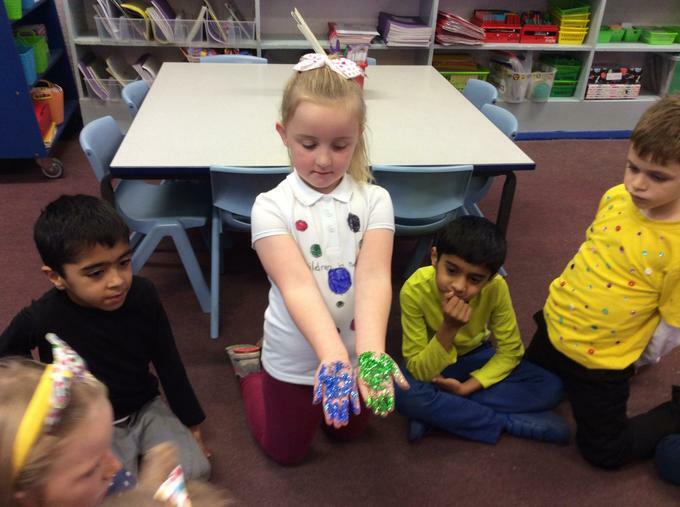 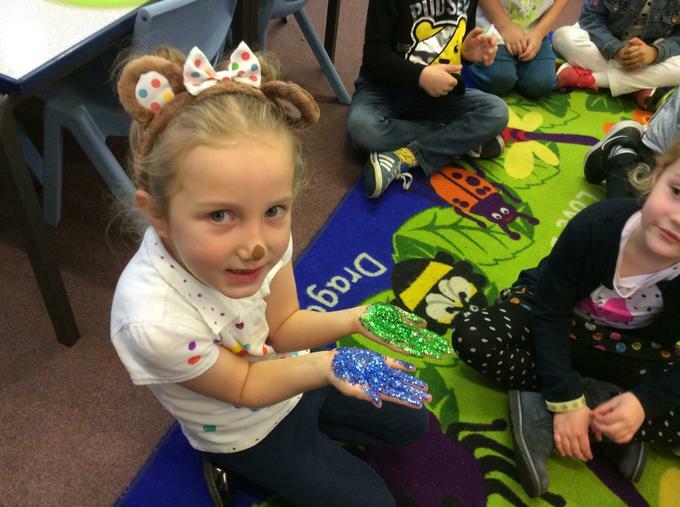 All hands had some glitter transferred onto them. 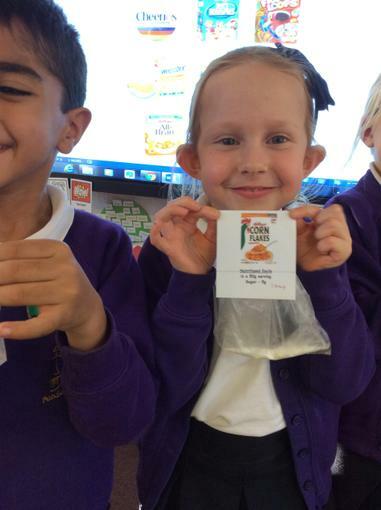 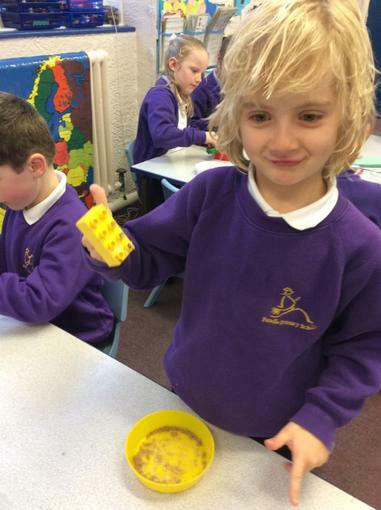 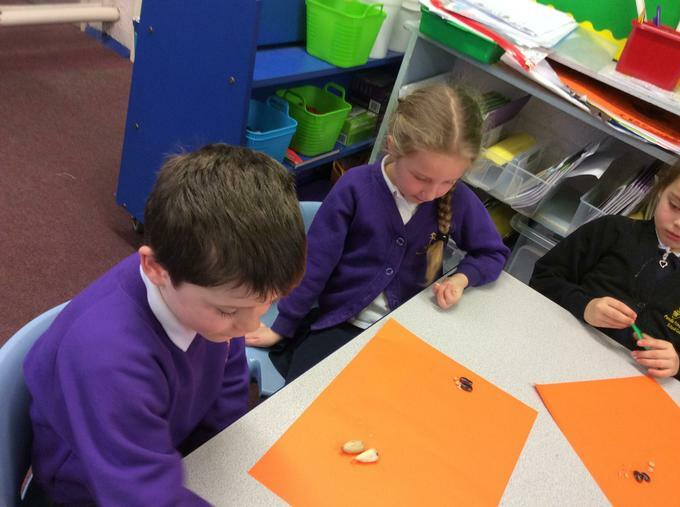 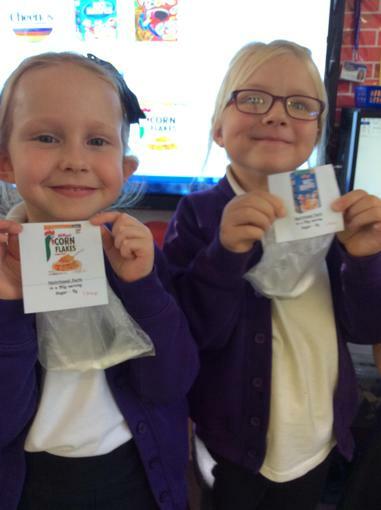 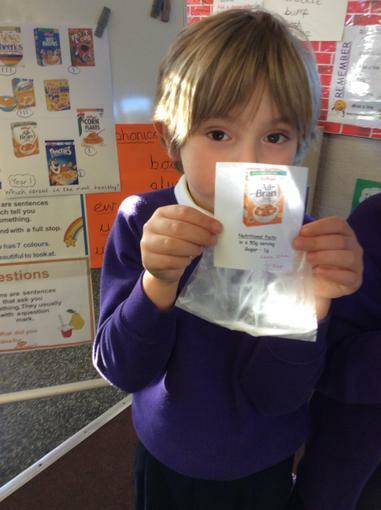 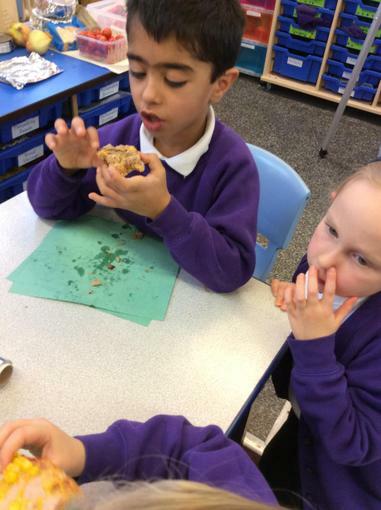 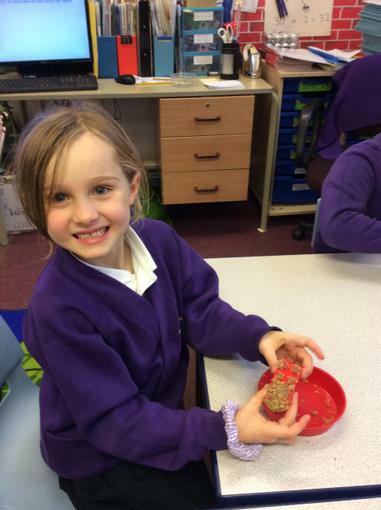 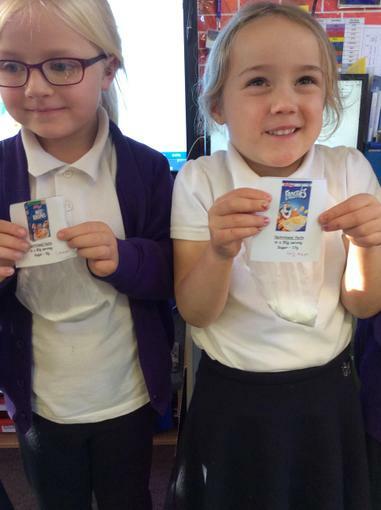 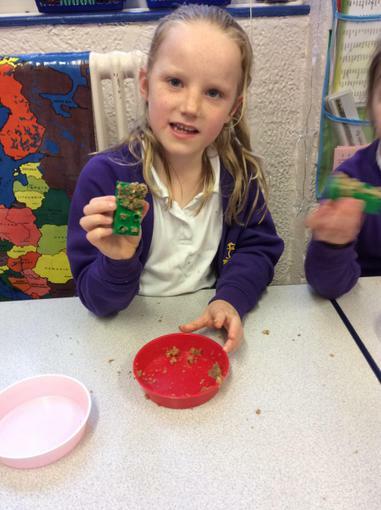 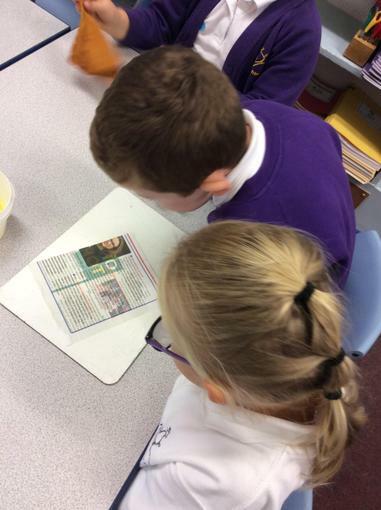 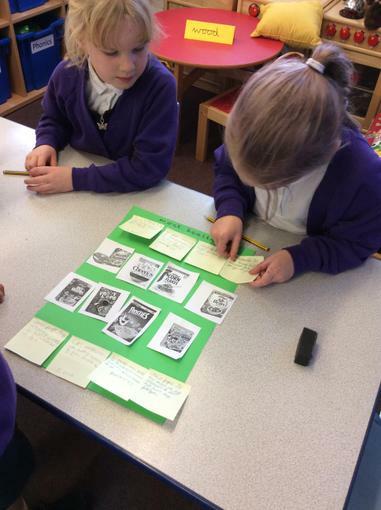 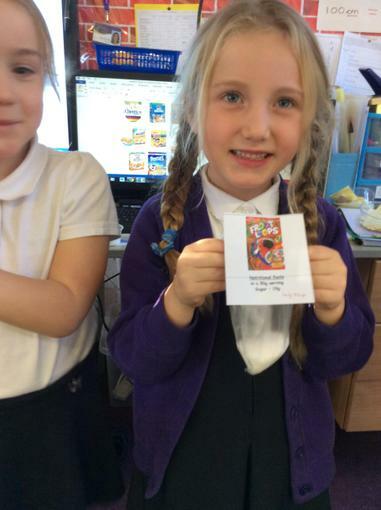 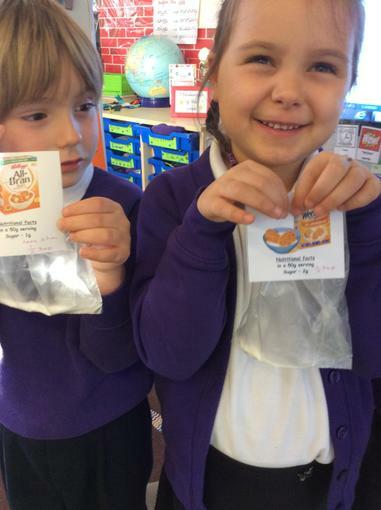 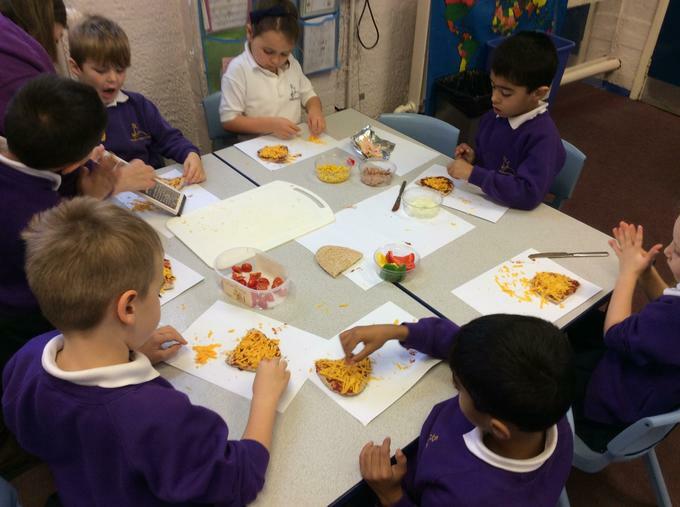 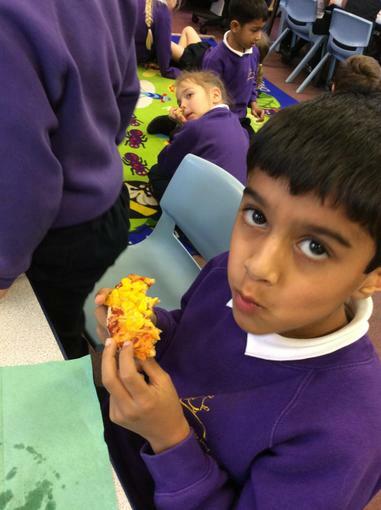 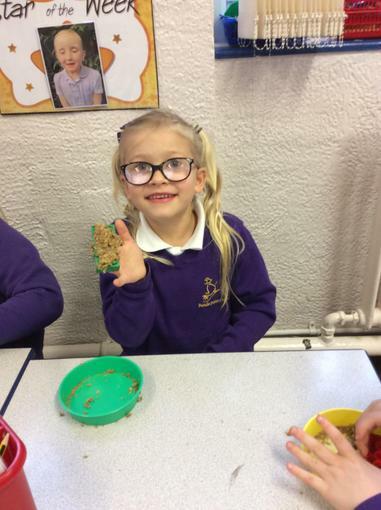 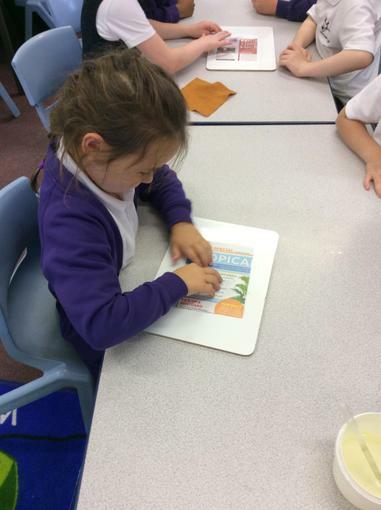 We looked at a selection of cereals and voted for the one we thought was the healthiest. 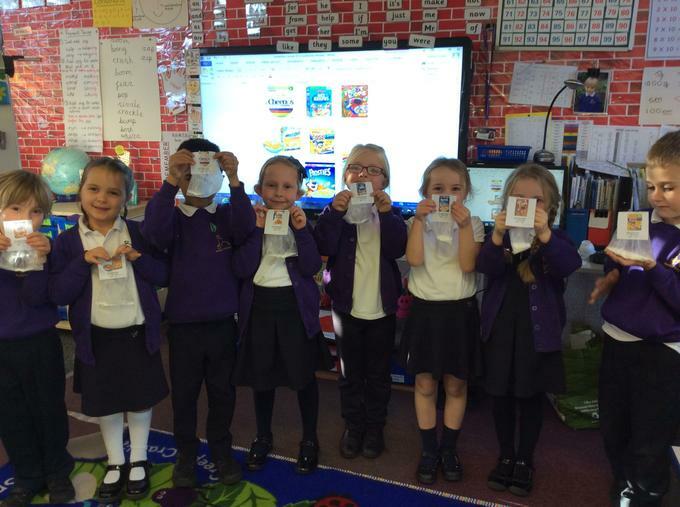 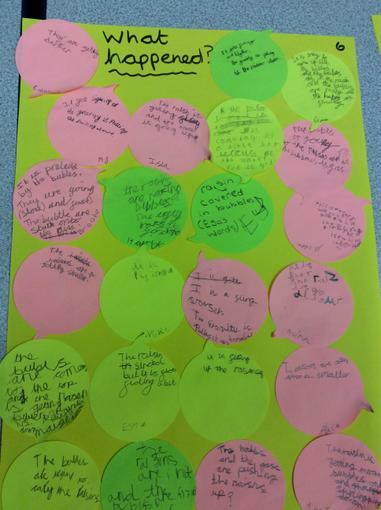 We put them in rank order from the most healthy to the least healthy and justified our reasons for their position on post its. 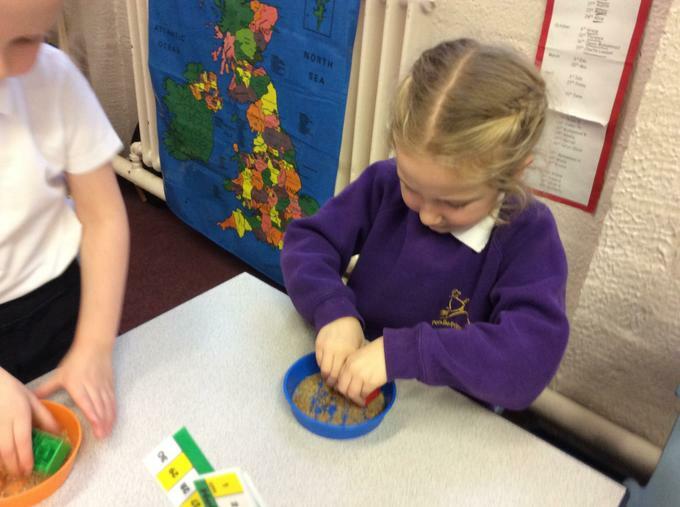 Then we looked at the actual sugar content in each cereal and put them in order from the cereal with least amount of sugar to the cereal with most amount of sugar. 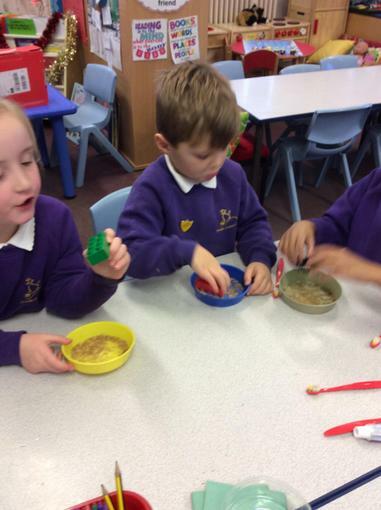 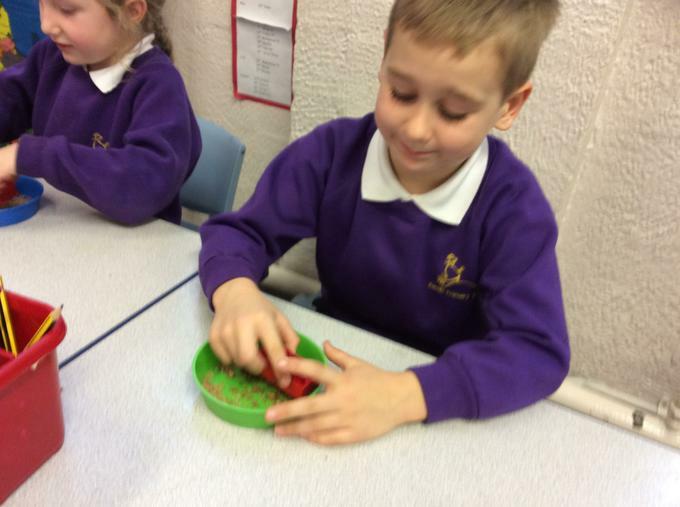 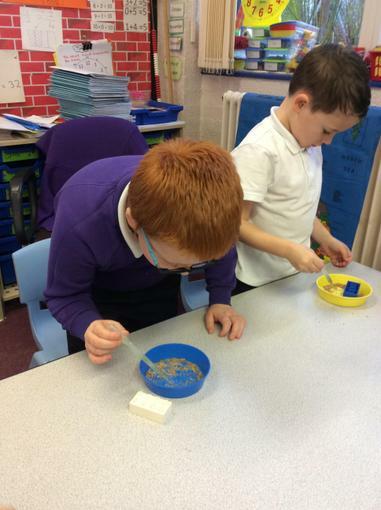 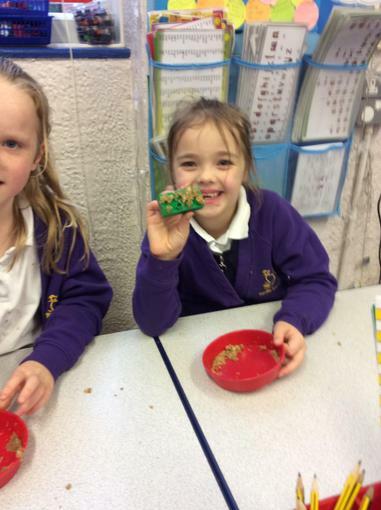 After we had seen the amount of sugar a small bowl of cereal, we voted again for the most healthy cereal. 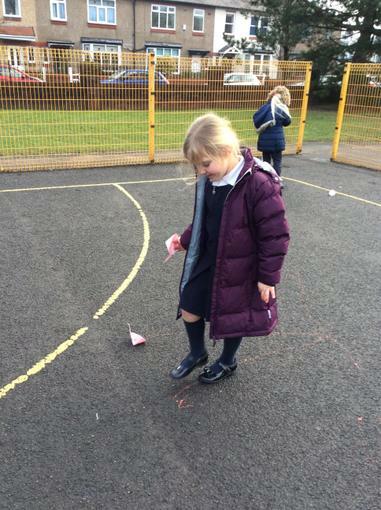 Naughty Nora the puppy is not yet house trained and has many accidents. 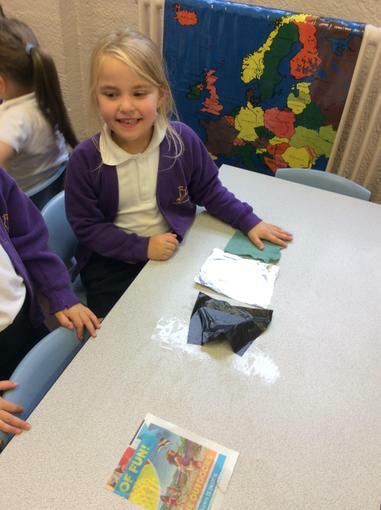 The children were asked to help find the best material out of a selection to mop up Naughty Naura's wee! 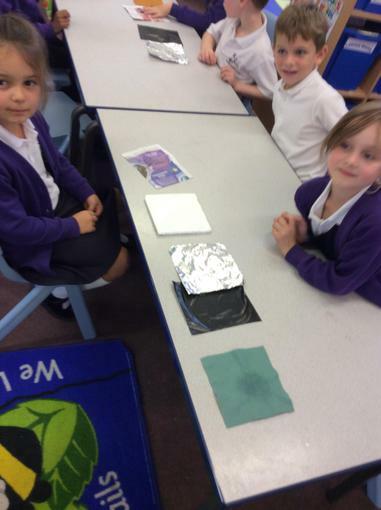 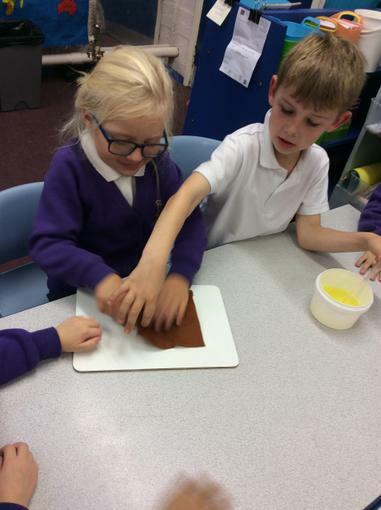 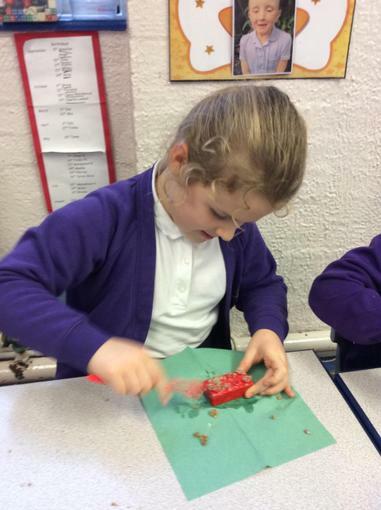 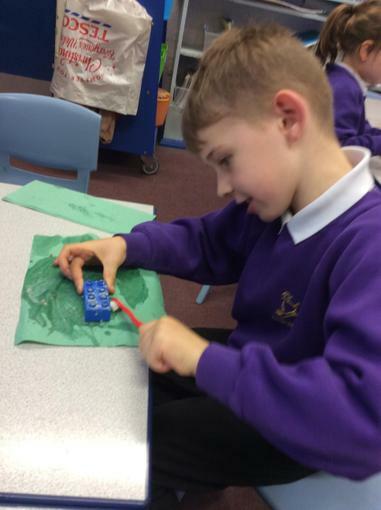 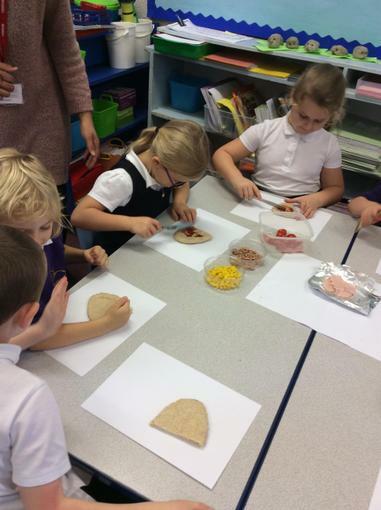 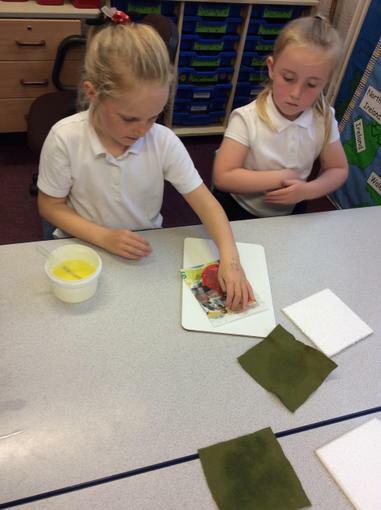 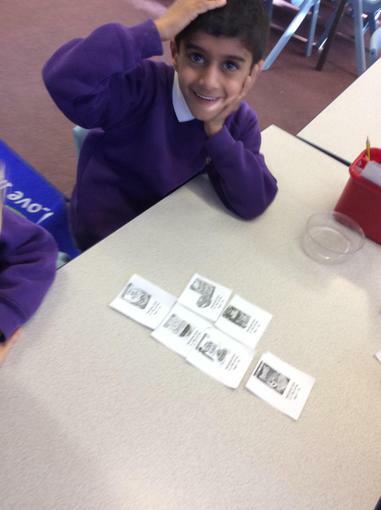 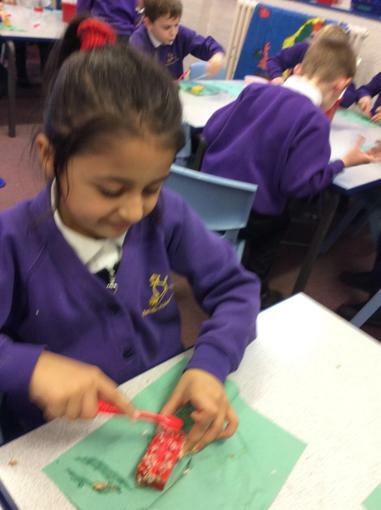 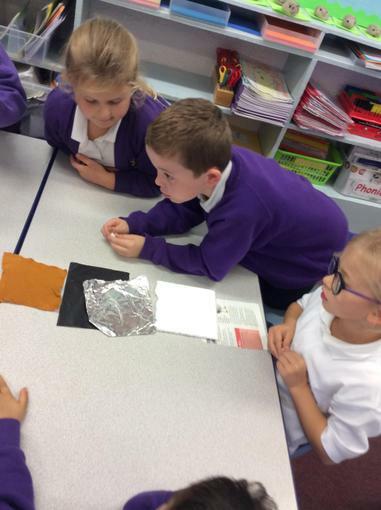 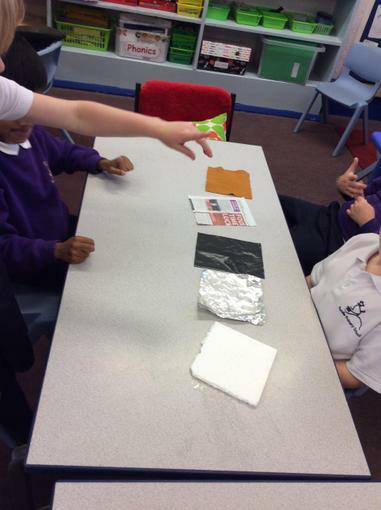 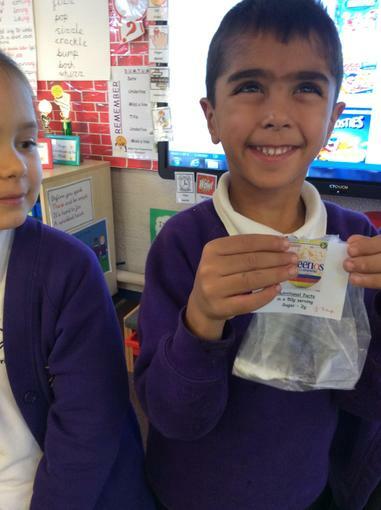 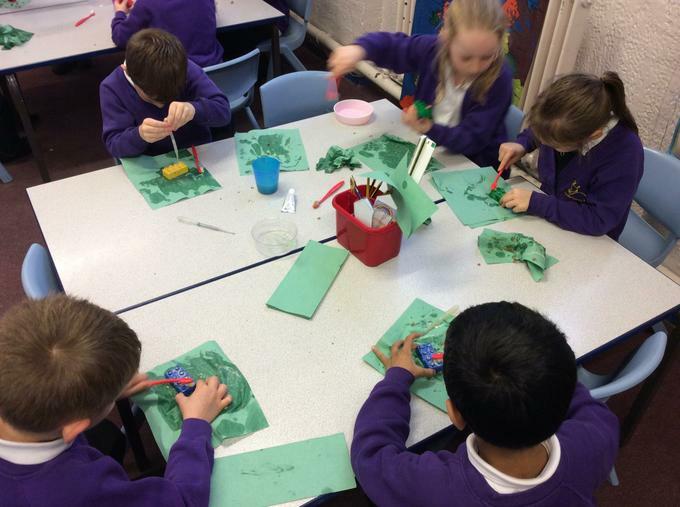 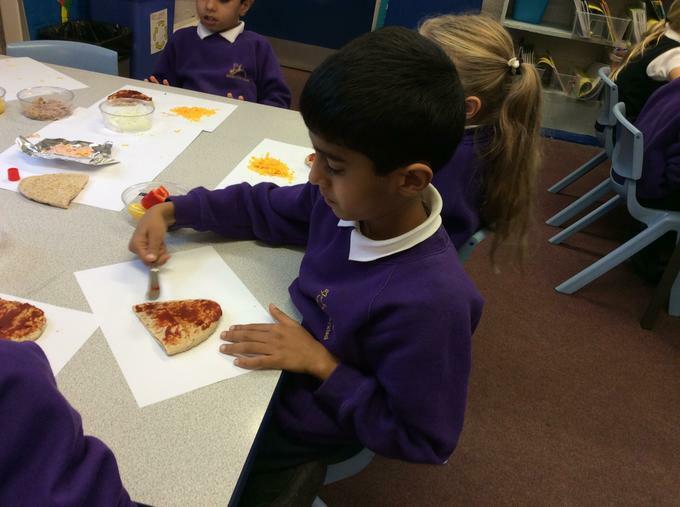 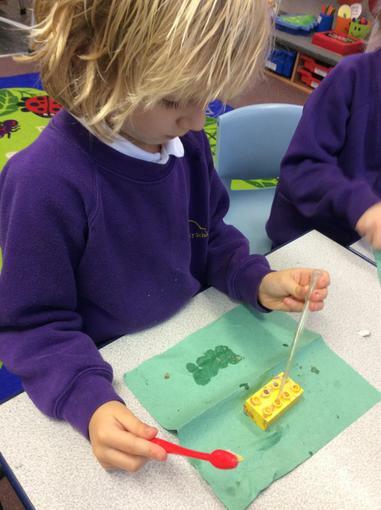 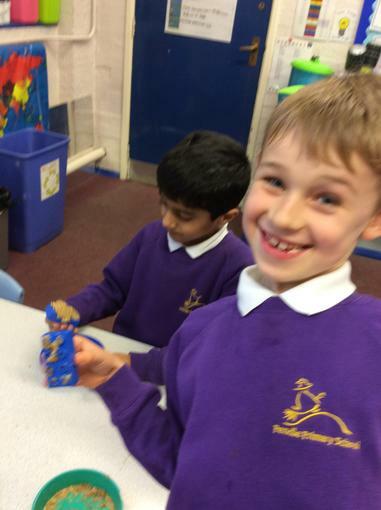 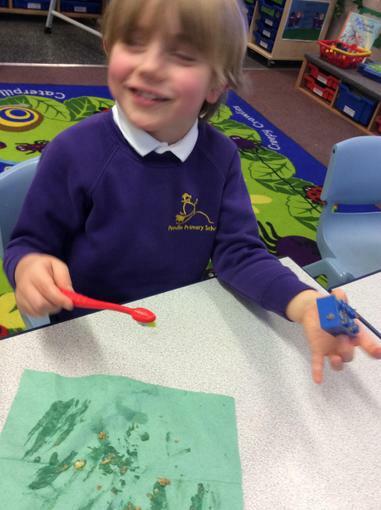 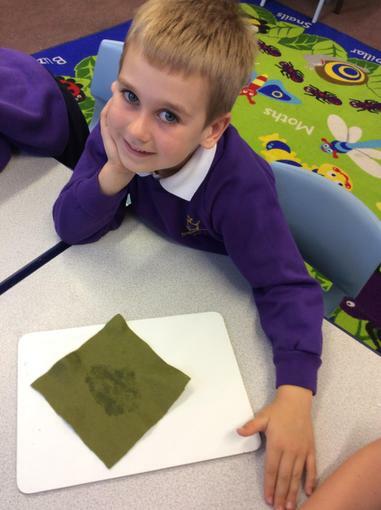 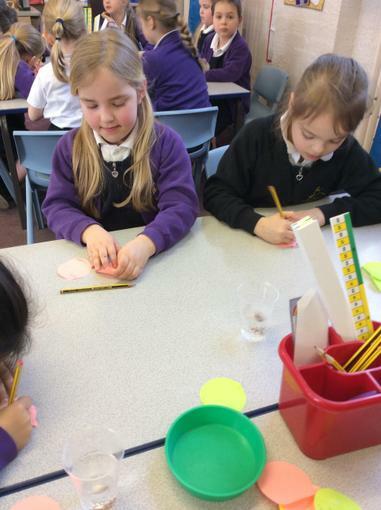 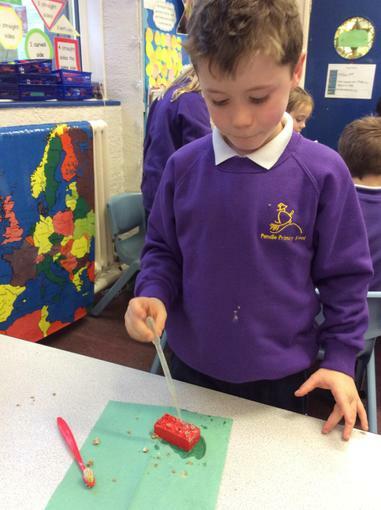 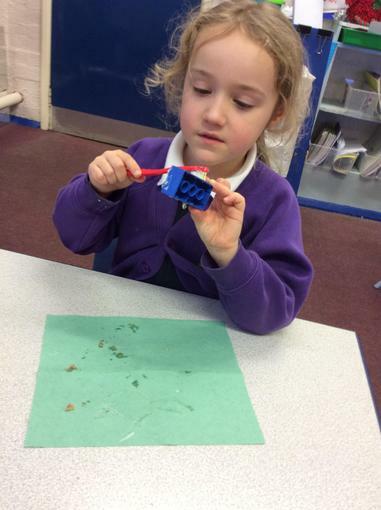 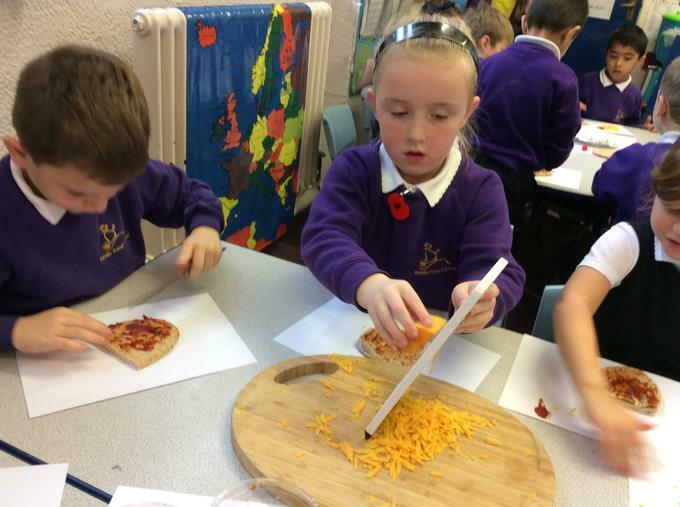 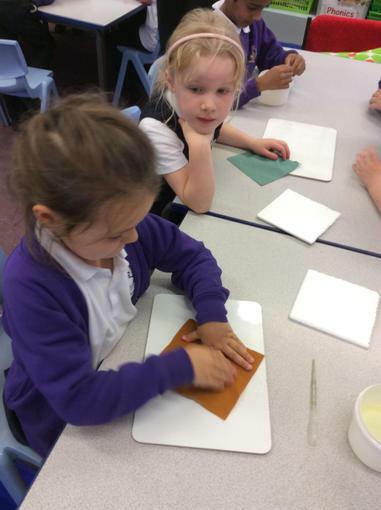 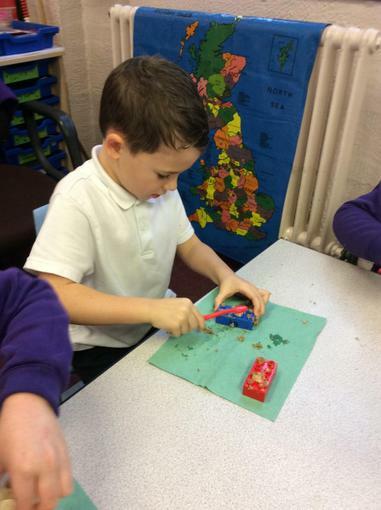 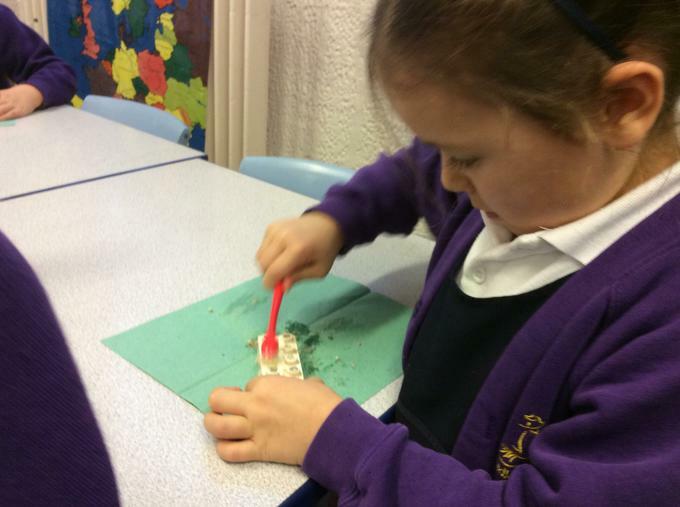 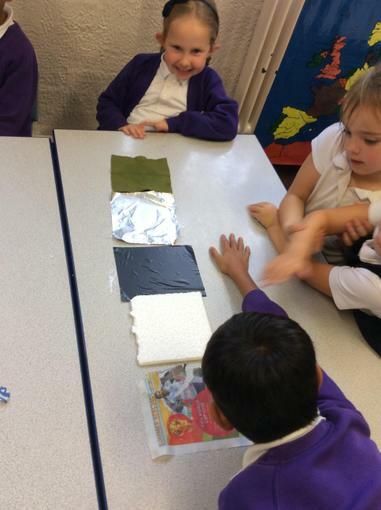 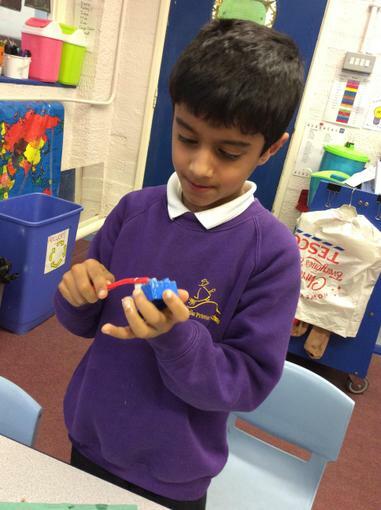 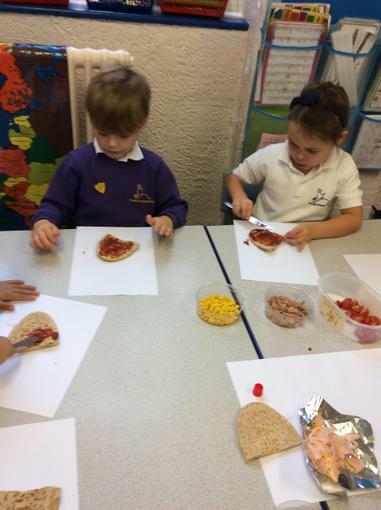 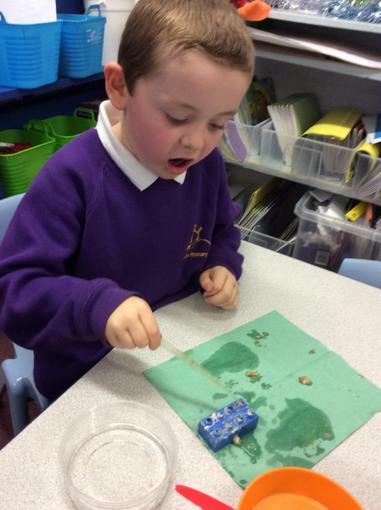 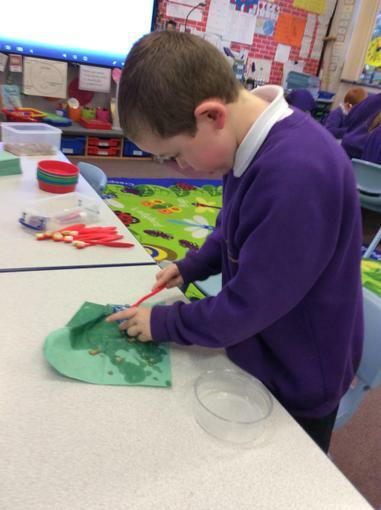 We tested each material after discussing how to ensure the tests were fair.